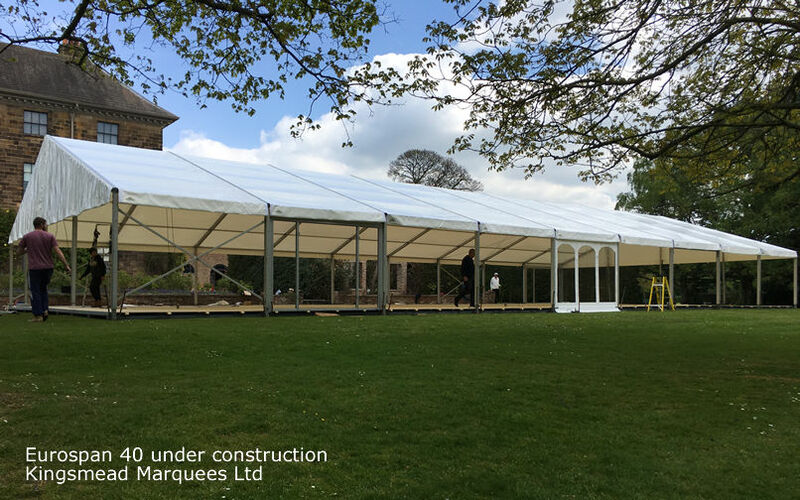 Kingsmead Marquees were delighted to be awarded the tender from The National Trust for a self - contained permanent wedding venue marquee in the beautiful grounds of historic Ormesby Hall in North Yorkshire. 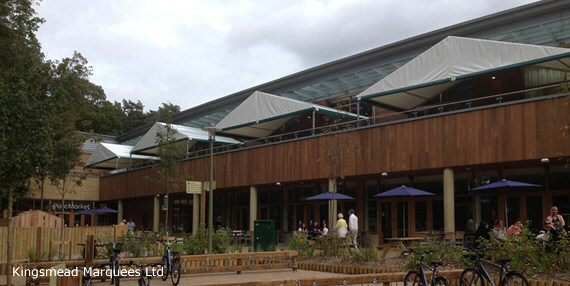 The structure was manufactured at our Frolesworth workshops and features a purpose designed floor system to avoid damage to the site. 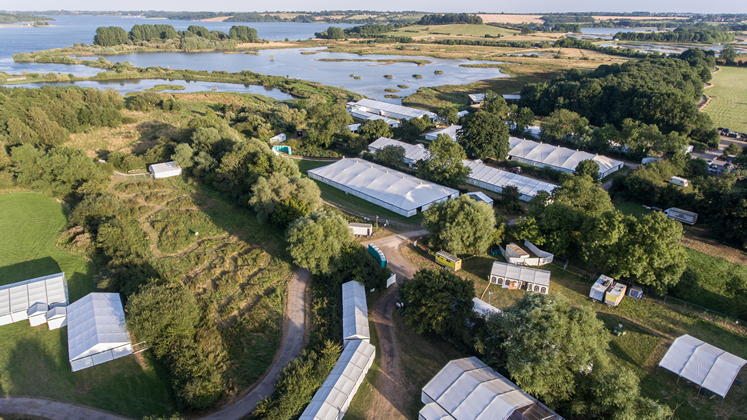 "Birdfair" as it has come to be known is a fascinating event to visit even if you have never even thought of birdwatching, and if you are an enthusiast you simply have to be there" says Andrew Breward, Kingsmead's MD. 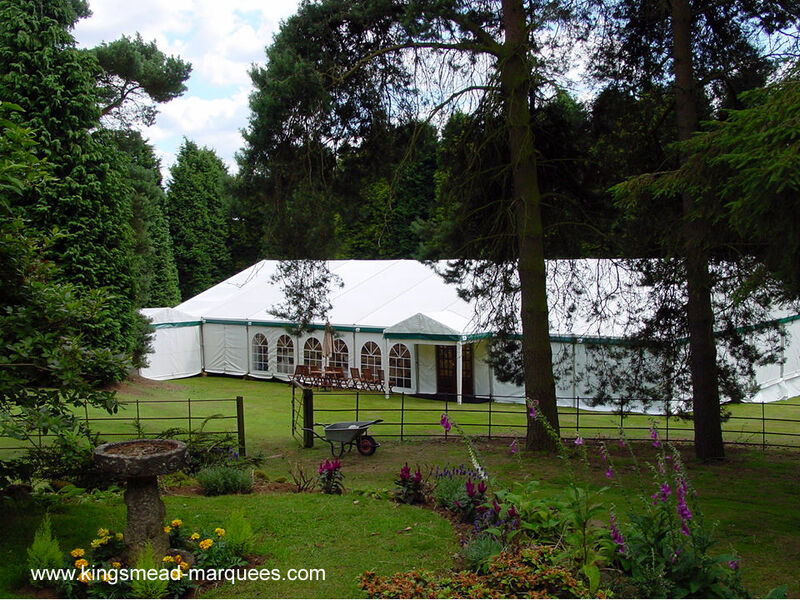 "I spend about a month there each year building & dismantling the marquees, and have done so for about 27 years so I guess I've spent about 2 years of my life there! but I still enjoy this lovely place'. 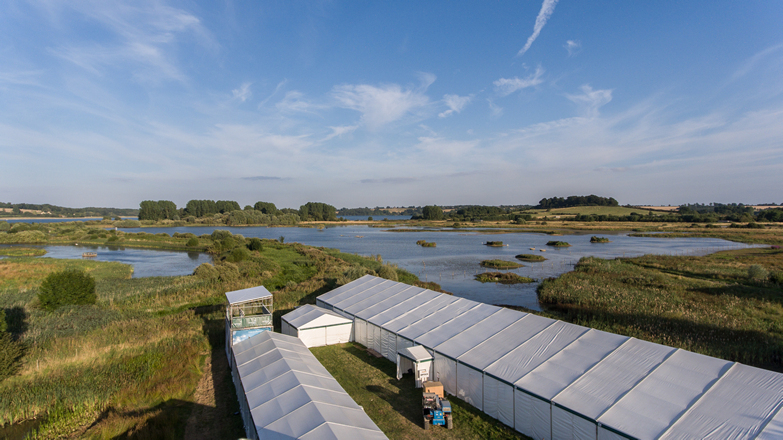 The British Bird Watching Fair is held every August at Egleton Nature Reserve. 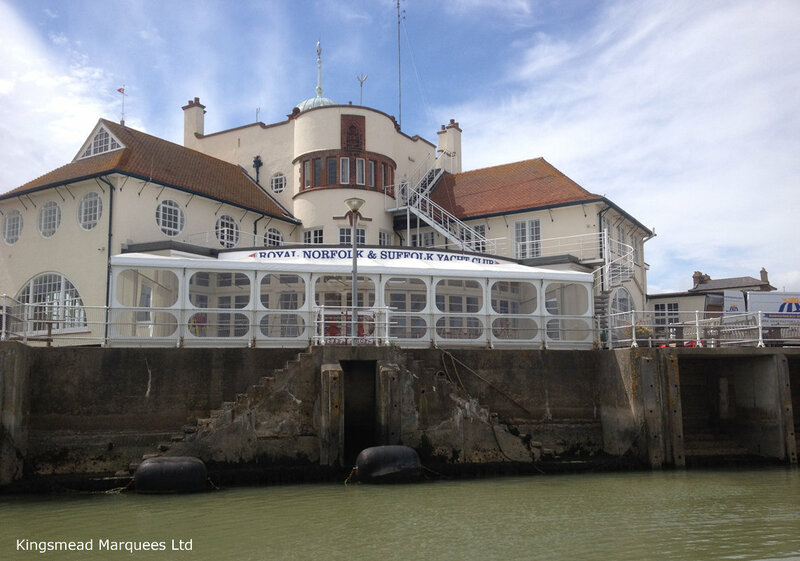 Kingsmead Marquees were delighted to be awarded the contract to design and produce a new awning for the RNSYC in Lowestoft, Founded in 1859 the club is housed in a wonderful grade 2 listed building prominently over looking the harbour entrance. 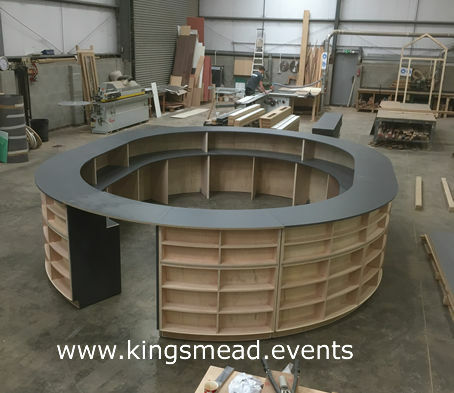 Andrew Breward, Kingsmead's MD, worked closely with the club's Commodore Mr. Knights to agree the details and the structure was made in our Frolesworth workshops. 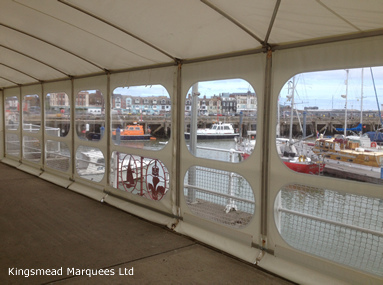 "The large curving frontage of the dinning room windows that open into the awning and the angles of the side walls gave the installation team much to ponder" said Andrew "but I am so pleased that the club are delighted with the final results". 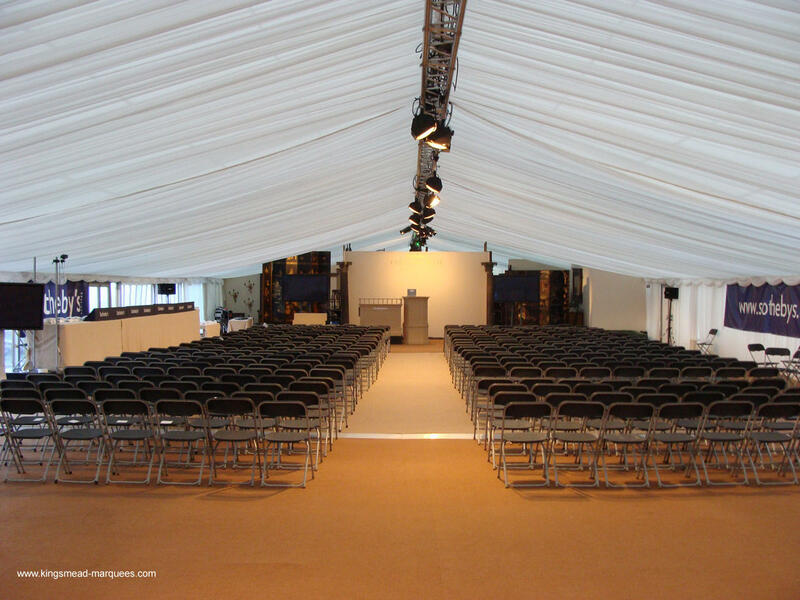 Two large 25m wide Semi -Tensile marquees and a 15m wide Eurospan Structure provided the main display area with sales, cafe, and blacked out lecture marquees accommodated in other Eurospan Structures at this lovely venue. 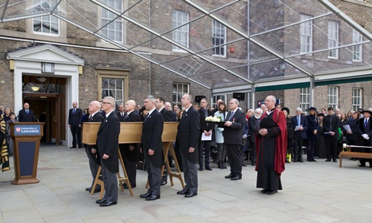 When the world got its first glimpse of Richard III’s oak coffin emerging from the doors of the University of Leicester on Sunday March 22 to be placed into a hearse, it was seen through a specially commissioned transparent, Eurospan Structure. 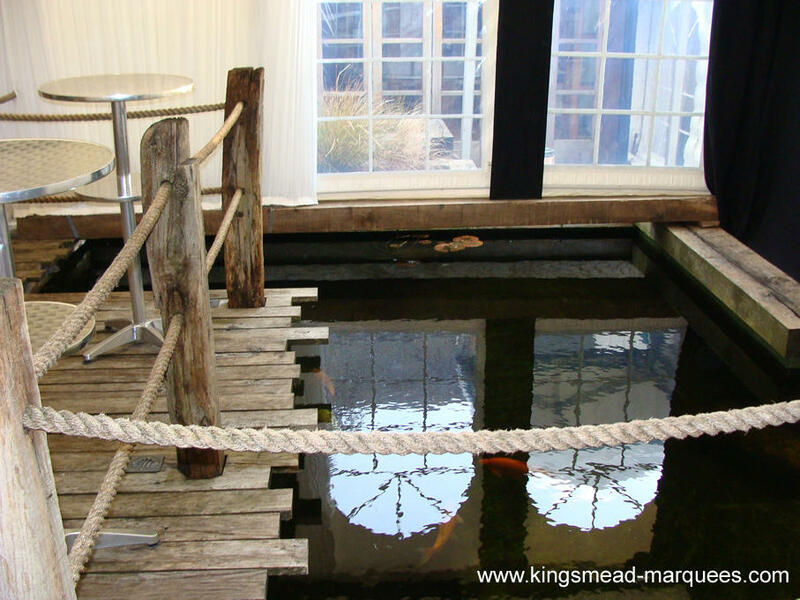 Kingsmead, had already proved its worth much earlier on in the king’s story. 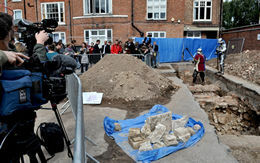 When the royal bones were first uncovered beneath Grey Friars car park, it was a Kingsmead Marquee that was put up over the dig site to protect the priceless remains in situ. 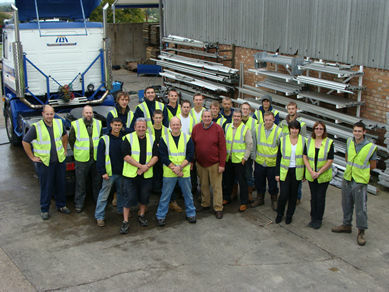 Three years on, the company that was founded in the 1970s by the Breward family from Barwell saw its work at the Centre of an international spectacle. 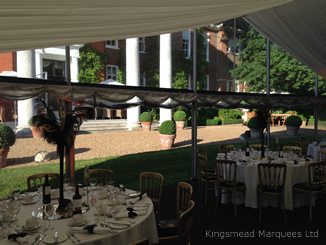 Kingsmead Marquees senior event manager Martyn Davies said: “The marquee was requested by the University to provide a clear cover so the world’s media plus distinguished guests and dignitaries would have a perfect view of the coffin when it made its first public appearance. “It was quite a few months in the planing”. 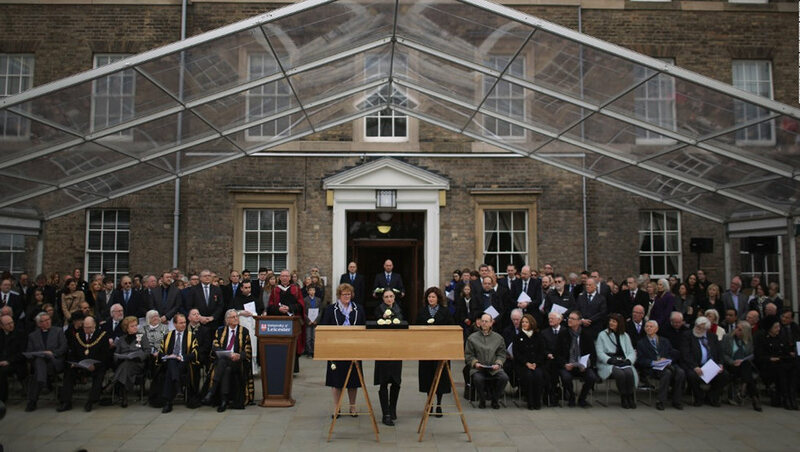 In addition to the 15m wide royal viewing structure, the company also supplied regular marquees for media use and receptions and arranged media staging, temporary walkways, and 100's of metres of crowd control barrier throughout the reinterment week. 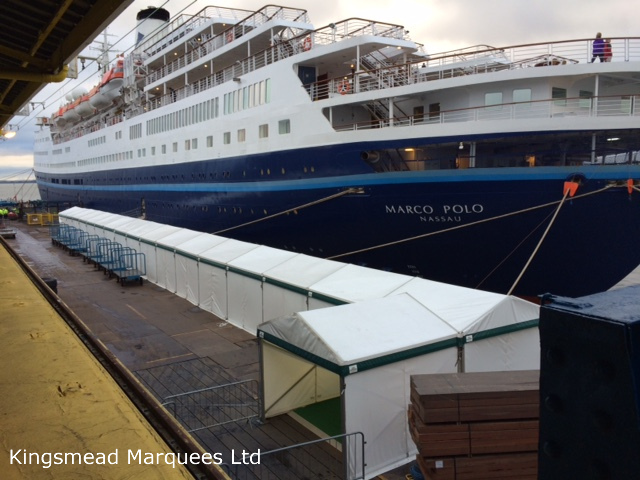 A versatile Eurospan Structure was the solution to an unusual request to provide a covered walkway allowing all weather access to ships visiting The London Cruise Terminal. Thousands of passengers used the walkway during the busy Christmas holiday schedule. 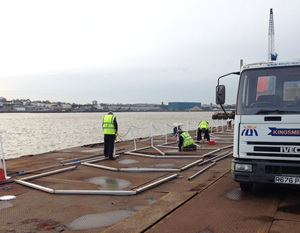 The challenging installation on a exposed 1080ft floating dock required special fixings that were made in our workshop to securely anchor the structure to the dock. Due to the schedule the carpeted and illuminated installation had to be completed in just one day. 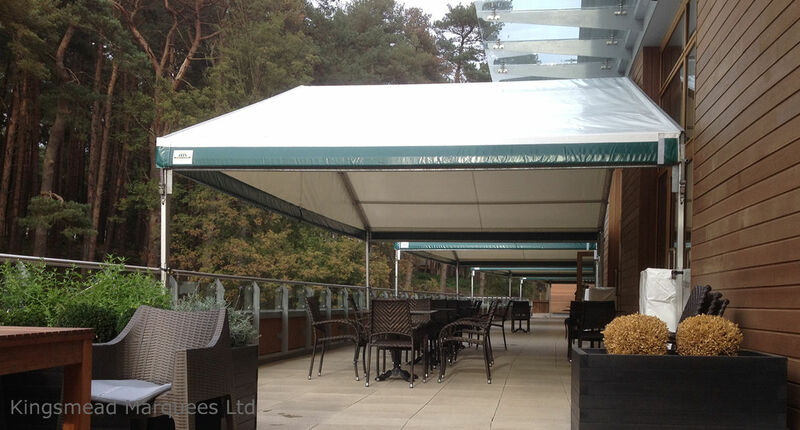 The Eurospan Structures had to be installed in just a few hours on a second floor balcony with limited access. 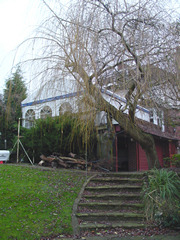 Our neat ballast system provided the necessary stability in a potentially exposed location. 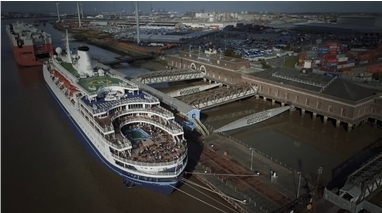 The recent reopening of the historic 1930s floating dock at Tilbury to allow cruise ships to moor close to London provided an unusual venue for a Eurospan Structure. 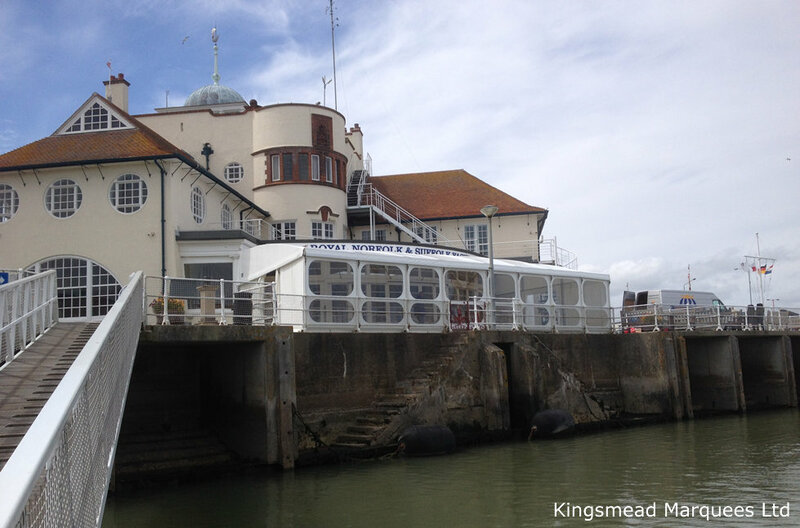 Passenger X-ray machines needed to be protected during refurbishment of this fascinating facility. 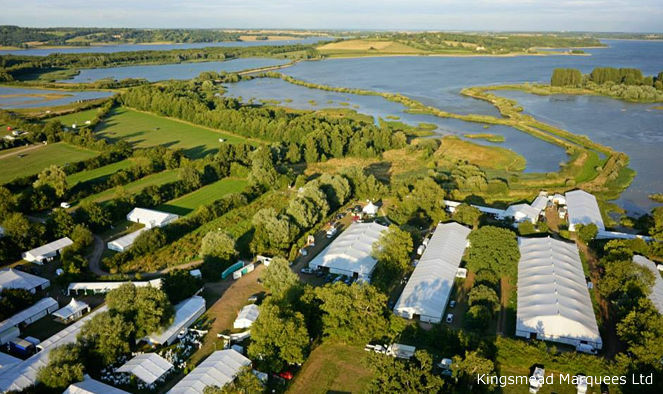 For 25 years Kingsmead Marquees have supplied all the marquees, furniture, and flooring for the annual British Bird Watching Fair held each year at the Egleton nature reserve near Oakham in Rutland. 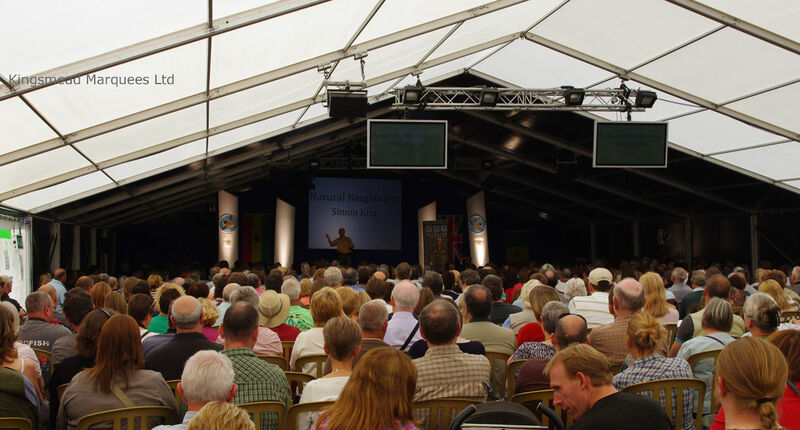 This event has now become the largest of its type, it attracts visitors and exhibitors from all around the world with profits from the fair used to support global conservation projects. 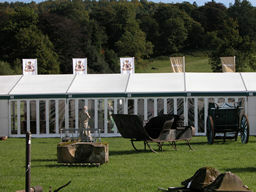 Over the years the event has grown, starting with just a few small marquees in a meadow. 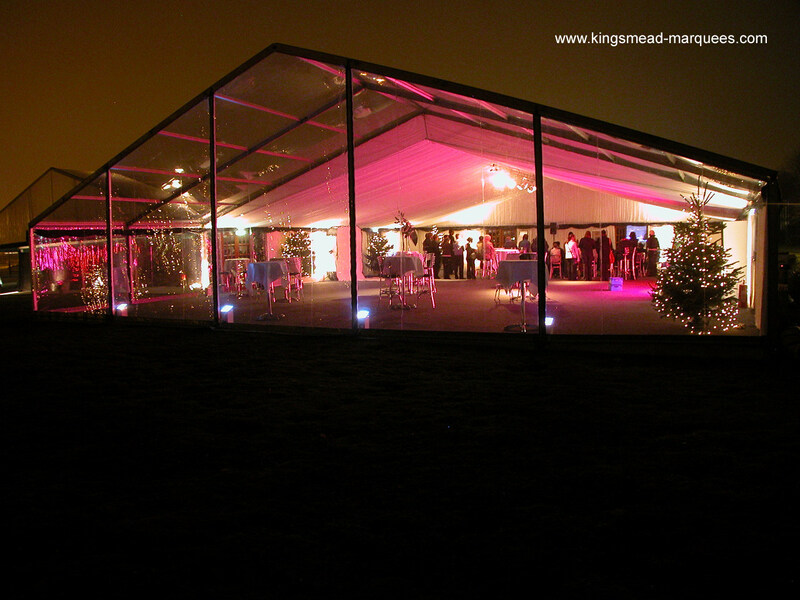 Despite its growth, Kingsmead Director Andrew Breward who has personally managed the installation and removal over the years says, 'the unique layout of the site makes the event like no other, with marquees positioned amongst the trees and hedgerows the scale of the event never becomes overbearing, armed with a site map, visitors delight as they discover the 12 main areas that make up the showground'. 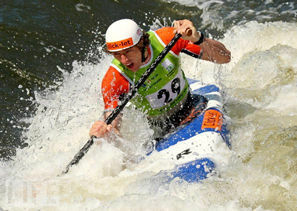 The ball was in aid of the charity React. Trumpeter's House is the former Richmond Palace and was transformed to transport guests to the daring and dynamic world of James Bond. A lovely part of Leicester's historic Belgrave Hall gardens have recently been re-landscaped to accommodate an extension to their own Eurospan Structure. 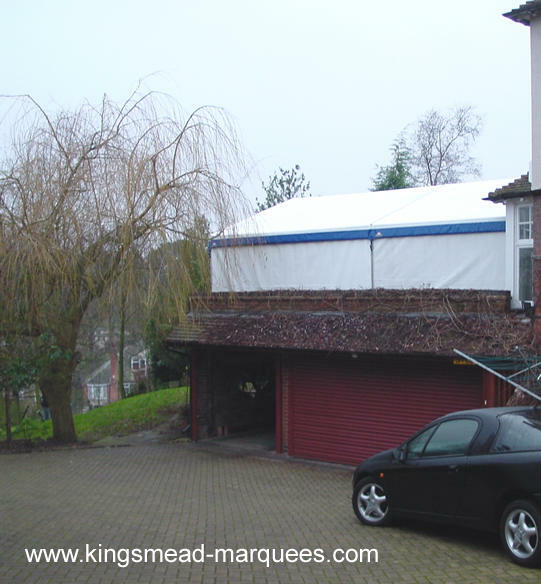 The original unit purchased from Kingsmead Marquees some years ago by Leicester City Council has now been enlarged to fit in the splendid new location. 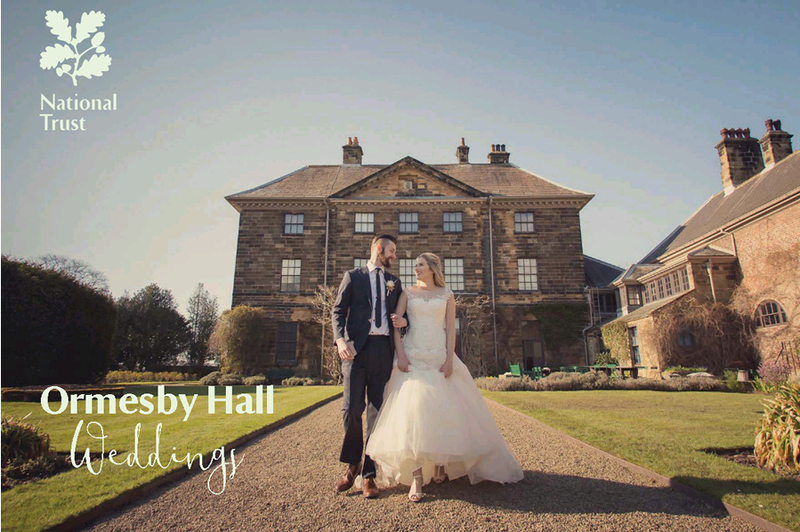 This exclusive location is available for events - please contact Belgrave Hall for details. The Eurospan Structure was especially designed to accommodate the sloping site levels. 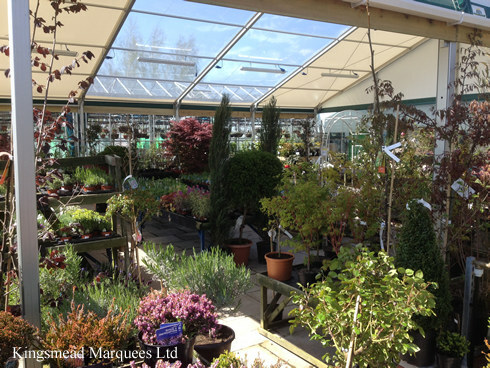 Clear and translucent roof sails provide an optimum environment for plants and flowers. 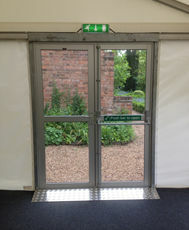 Wall sections can also be fitted for use in the winter months. 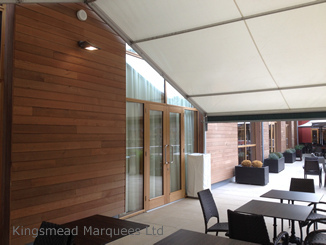 Following the installation of a self contained Eurospan hospitality structure at Leicester Racecourse last year we were delighted to be asked to provide a similar structure for Stratford Racecourse. 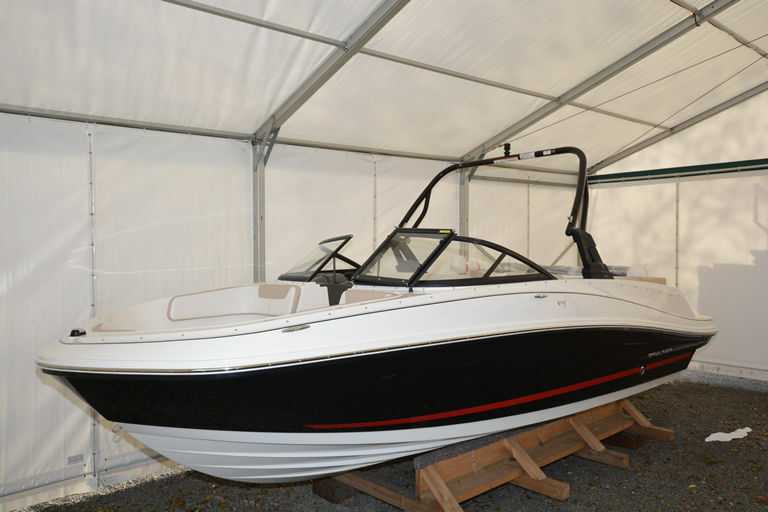 The permanent installation has achieved full planning consent and features glazed aluminium windows and doors with matching hard wall sections, the interior is fully lined and carpeted. 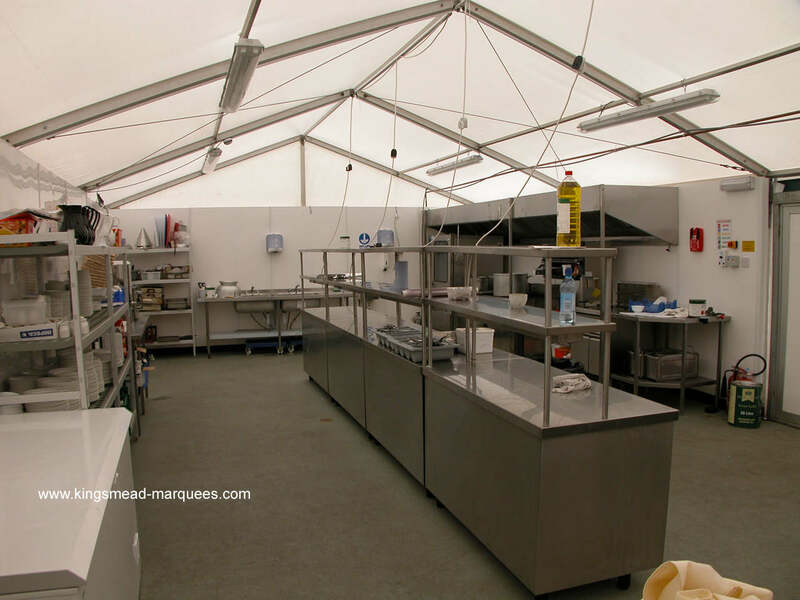 The new structure was completed in June 2013, and will offers a versatile internal layout with up to 5 separate hospitality areas all linked by a service corridor from the kitchen. 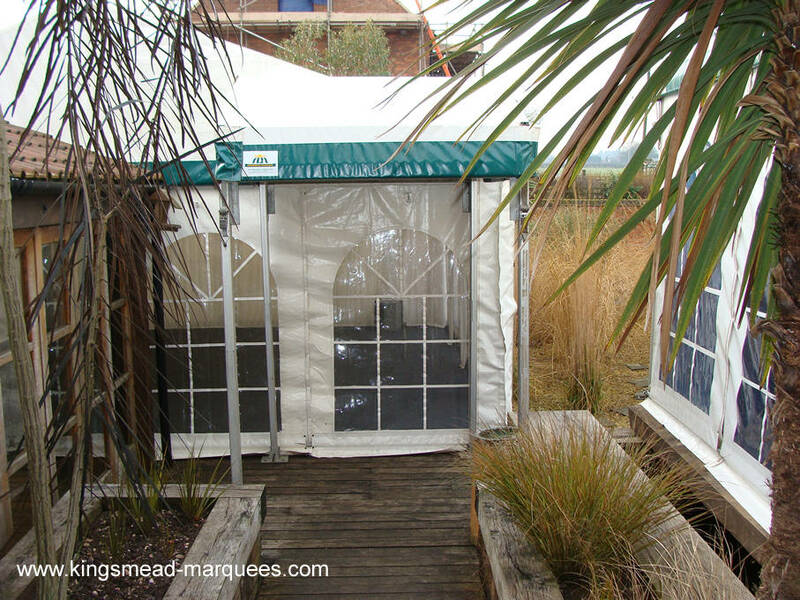 These 5 areas can be adjusted in size, linked together or opened into one large space to best suit the guest numbers. 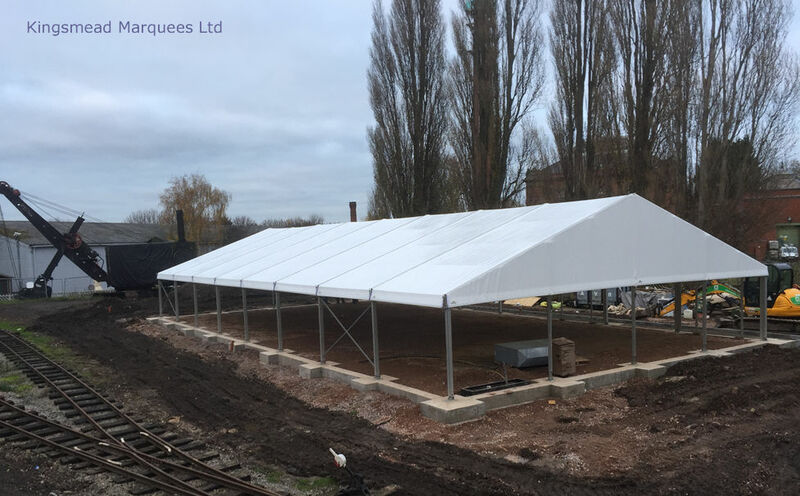 Our fabric workshop recently completed a major restocking build of our 80 ft wide semi-tensile marquees, these ever popular marquees provide an economical alternative to large frame marquees. Equally at home providing showground exhibition space with wall heights up to 10' high or fully lined and fitted with flooring, lighting, stages, dance floors, heating, etc. for a large number of seated guests. 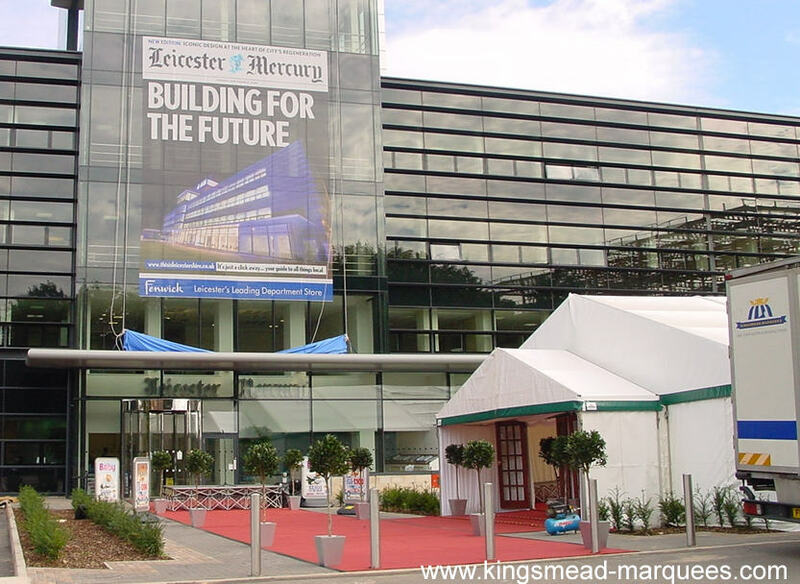 Kingsmead Marquees were delighted to have been awarded the contract despite stiff competition to design and build a new permanent hospitality structure for Leicester Racecourse. 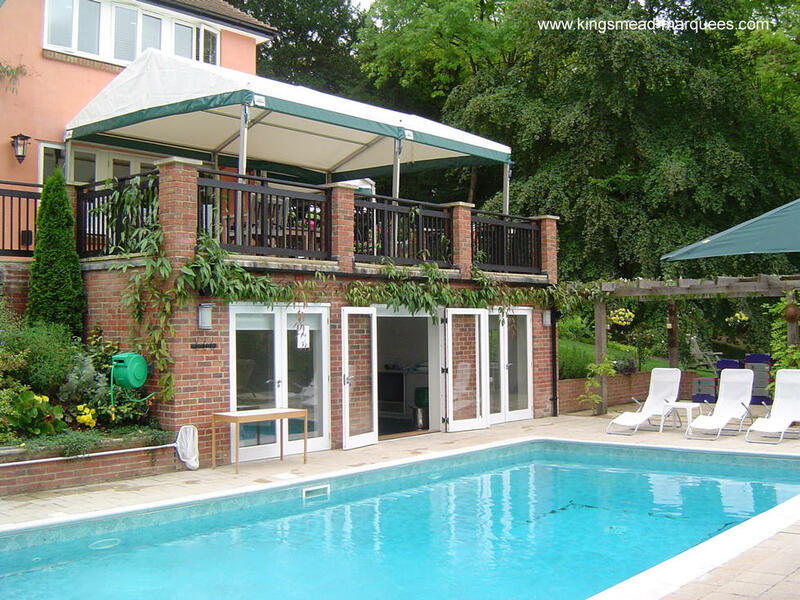 The structure is installed on a concrete base with a raised aluminium and wood floor and features a special concealed roof guttering system. 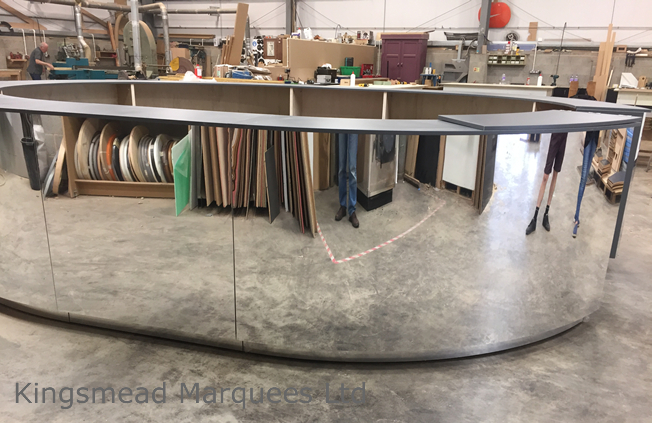 The Eurospan Structure features a distinctive five sided end section and incorporates insulated hard walling and our new aluminum glass door & window units. 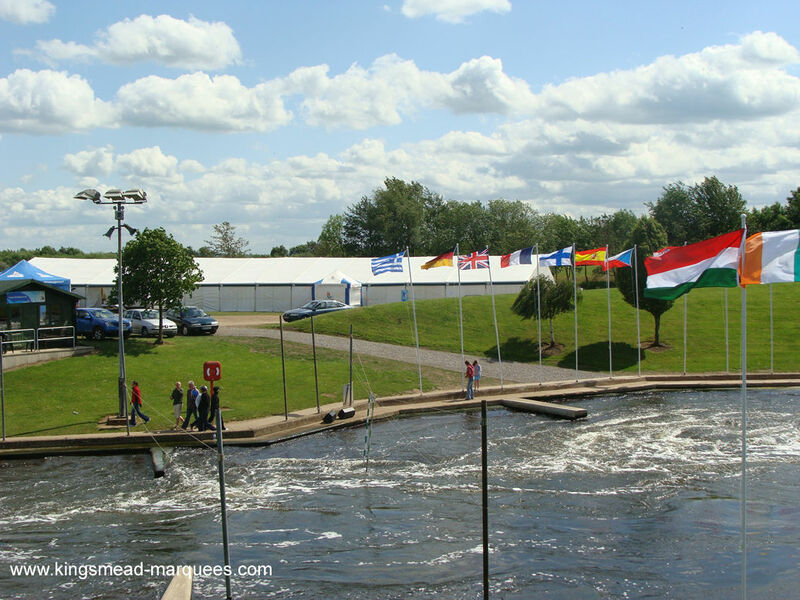 Permanent Eurospan Structures are used at many venues throughout the UK including Theme Parks, Hotels, Golf Clubs, Industrial Storage, Wedding Venues, Play Areas, Workshops, Pubs, etc. 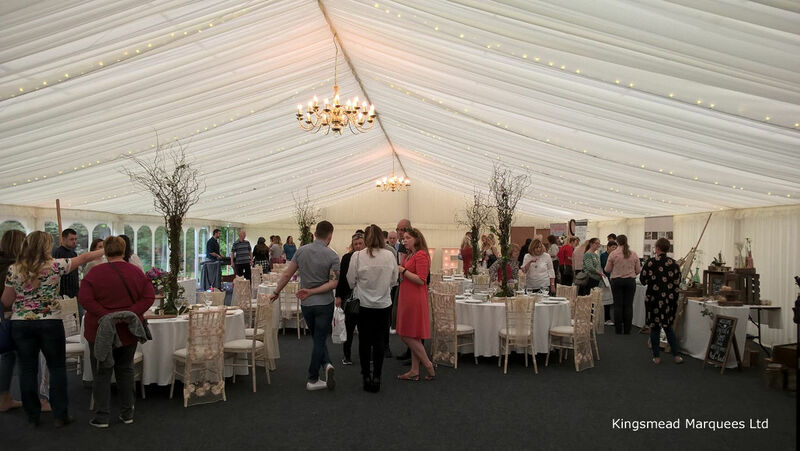 Events Manager Martyn Davies assured the family that the look of the marquee could quickly be totally transformed between a stunning hot pink themed 21st birthday celebration bash to a spectacular American style red white & blue wedding marquee. 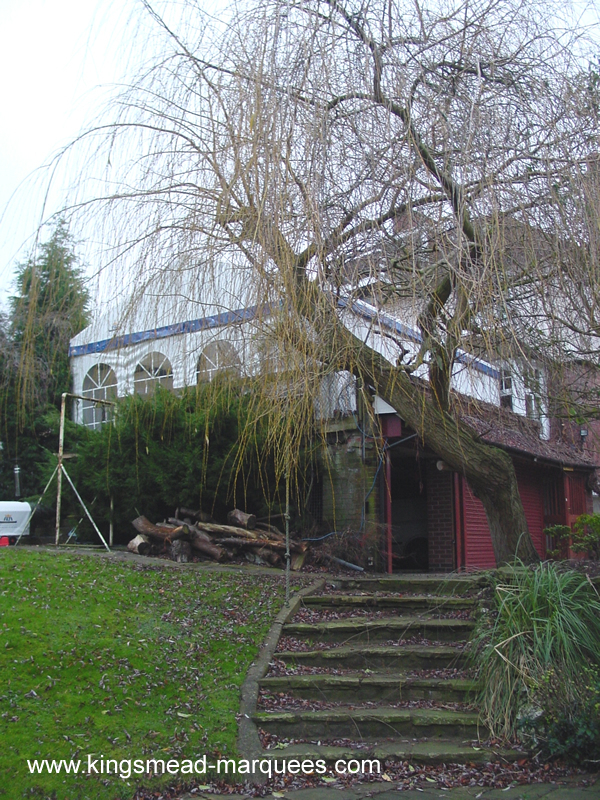 The change over took just two days and also provided a cost saving for the client. Congratulations are in order to both Richard Breward & Ian Farmer who both achieved their Class 1 Articulated HGV licence recently. Operations Manager Paul Clarke said 'The driving standard required is very high and both did very well to pass first time with a very high pass mark'. They can now assist Paul in being able to drive the largest vehicles in our transport fleet. Sturgess Jaguar Leicester required an extension to their prestigious showroom for a special event in February. 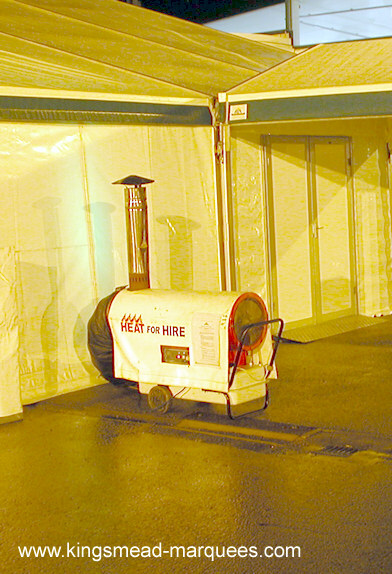 A Eurospan Structure was chosen with a ballast system to avoid any fixings into the car park surface, the interior was fully lined and carpeted, and LED lighting provided a distinctive look for the evening event, mobile toilets connected via an awning and heating was provided. 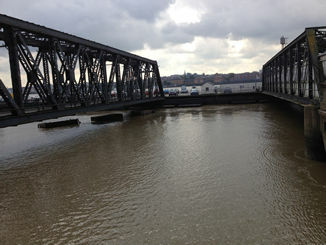 To minimize disruption the project had to be completely installed in half a day and was removed in just 4 hours the next morning. 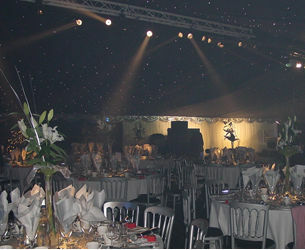 Despite sub-zero temperature's outside 800 guests enjoyed a fabulous evening of good food and dancing in early January in complete comfort. 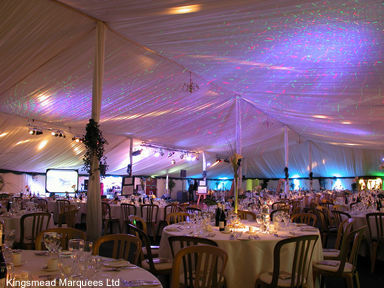 The annual event was hosted in a semi-tensile marquee at Wartnaby near Melton Mowbray and was completely self contained with all facilities including separate cloakroom, reception bar, chill-out lounge,and kitchen. 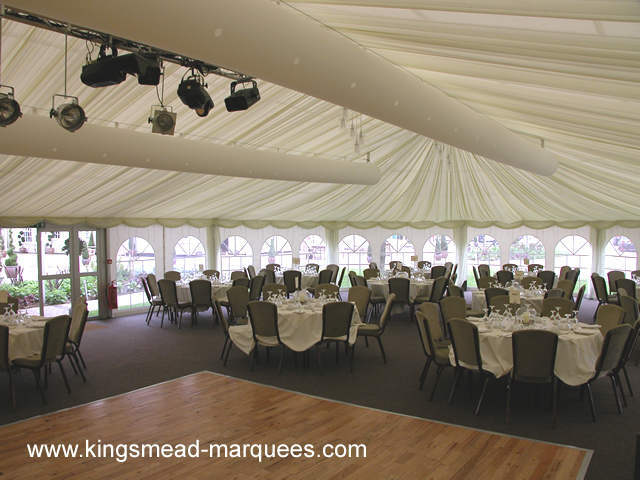 Kingsmead Marquees were busy during the cold winter months thanks to the superb heating systems now available for our marquees, we stock all equipment required and can integrate the warm air systems with any size of marquee installation. 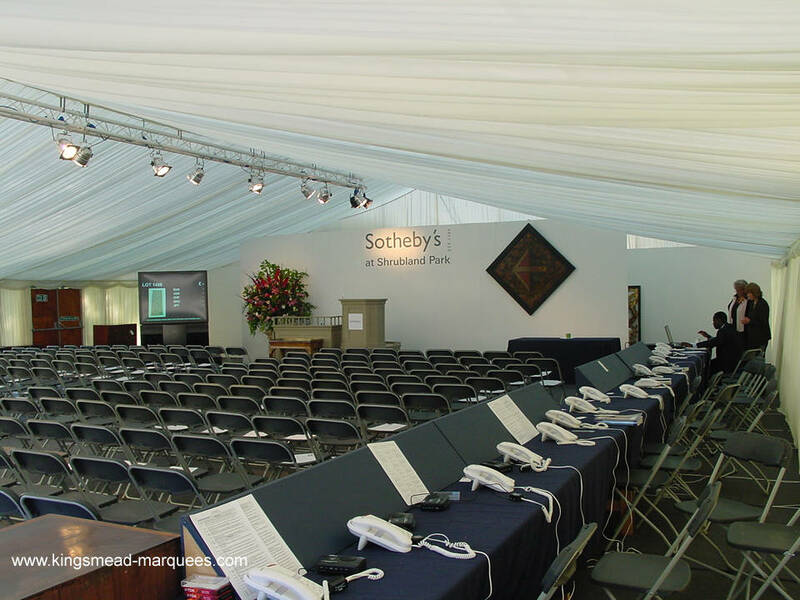 Kingsmead Marquees were delighted to be asked by Sotheby's to provide all the marquees for The Attic Sale to end all attic sales at one of Britain's top country houses Chatsworth in Derbyshire. 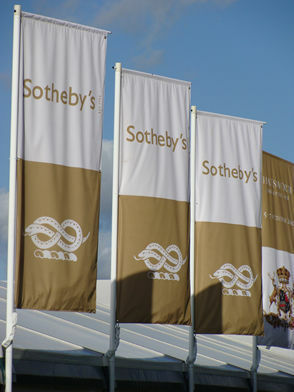 The sale attracted world wide media attention, with sales in the first 3 hours on the first day exceeding the total three day estimate, final sales were 6.5 million pounds. 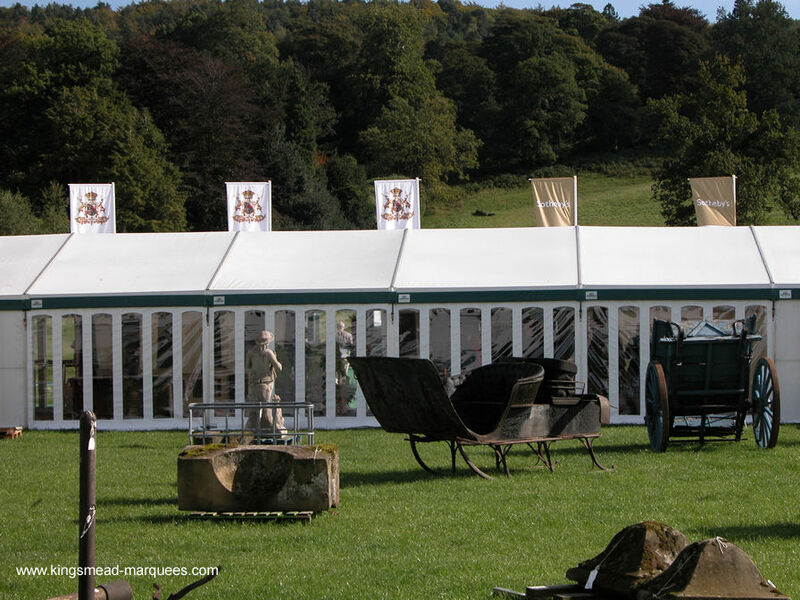 The site within the grounds of Chatsworth required all services for the sale to be provided by Kingsmead and included six inter-linked Eurospan Marquees covering an area the size of a football pitch. 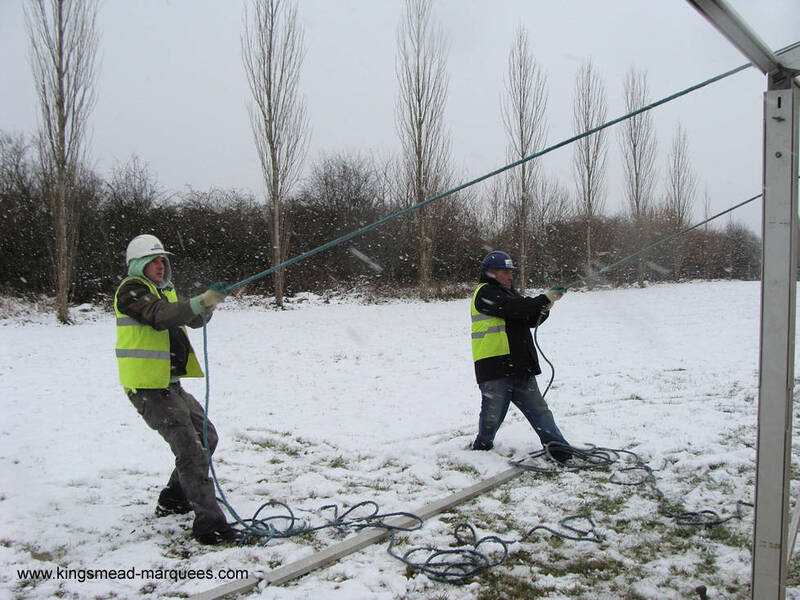 Heating, lighting, power generation and distribution, furniture, flooring, linings, PA and sound recording, portable roadway and toilets were all supplied, the month long project was completed in good time despite challenging weather conditions. 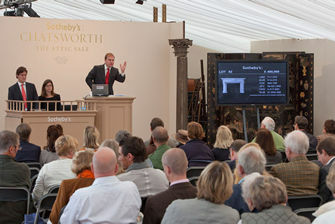 In a spring clean which lasted 18 months Sotheby's experts cleared out more than 20,000 objects for the sale, items stored not only in attics but in dozens of redundant servants' bedrooms at Chatsworth, and in stables and farm buildings. 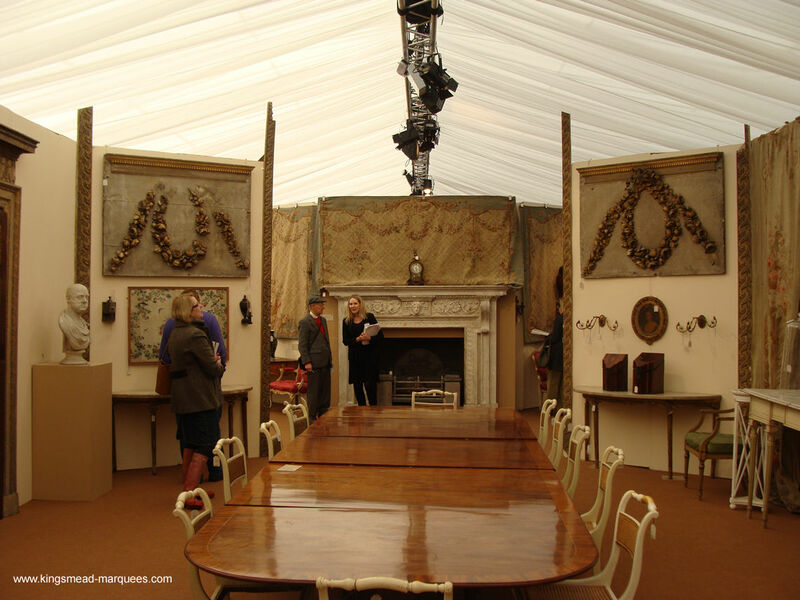 The fireplace was found dismantled into 30 pieces in a building once used to repair tractors ! 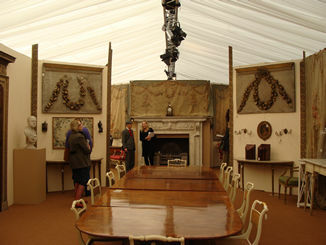 In addition to the seated audience the sale room also received bids via telephone and the Internet where it could be viewed live. Congratulations were in order after 3 candidates of the company Paul Clarke, Richard Breward and Ian Farmer successfully complete their NVQ Level 3 Temporary Structures qualification with a further 9 receiving training on the MUTA Marq structure safe course. 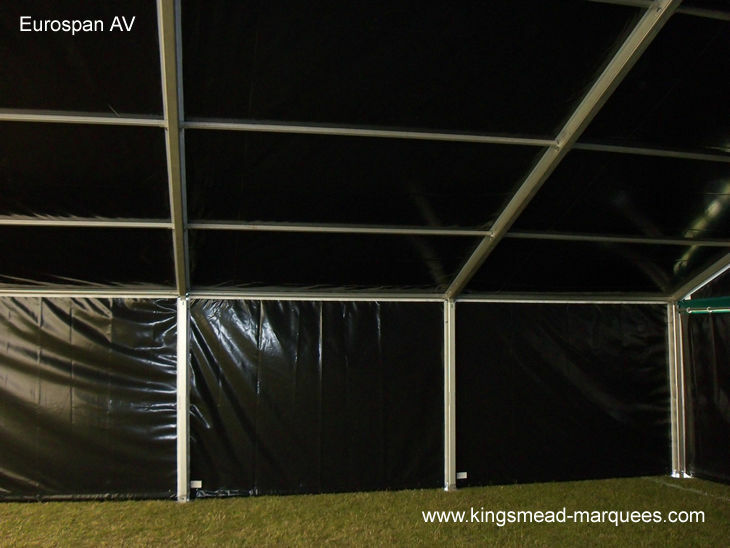 Kingsmead Marquees has an enviable safety record throughout 40 years of marquee hire and manufacture,with tens of thousands of people in our marquees each year, extremely high standards of installation are required, this can only be achieved by a well trained and equipped crew. The fabric used is white on the outside and black inside creating a total stoplight that is ideal for AV presentation, lectures, theatres, or any event were effect's lighting is required, or film / video are used. 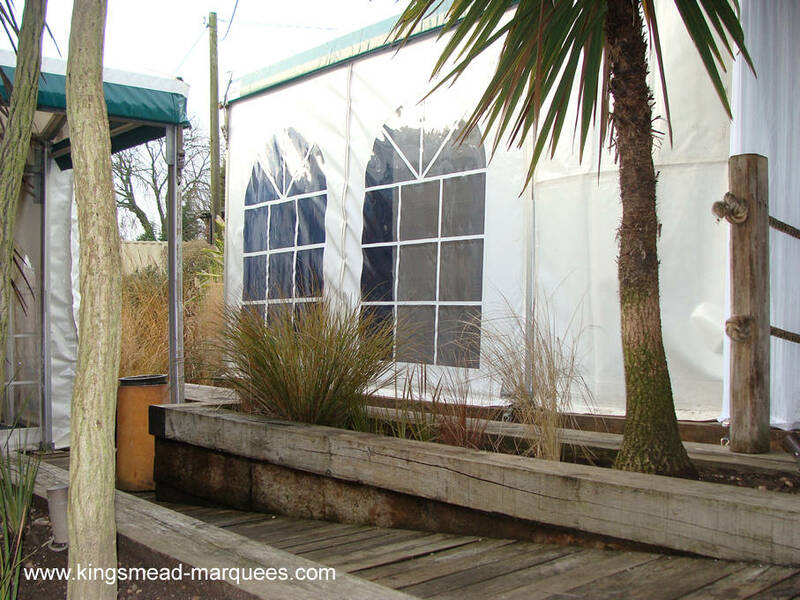 After initially hiring the marquee the venue became so popular for all types of events that owner Billy Allington decided to commission the manufacture and installation of the bespoke structure. 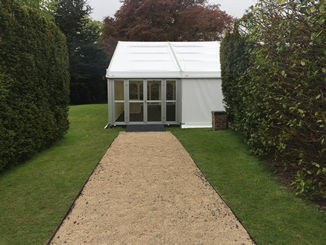 In March this year we were asked to provide a wedding marquee installation over a very 'tricky'site which involved encompassing formal flower beds, large topiary trees, hedges and large garden planters, all to be in a symmetrical alignment and joined to a permanent building which was at a different angle. 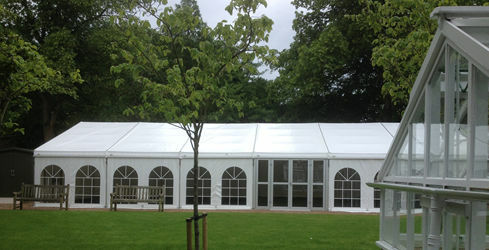 Thinking caps on, and a fairly difficult install in horrendous weather conditions took place, this involved two large marquees joined together to create a separate reception and dining area, clear gables and outdoor lighting to show the fabulous formal gardens and mobile toilets enclosed within their own lined marquee linked to the main marquee. 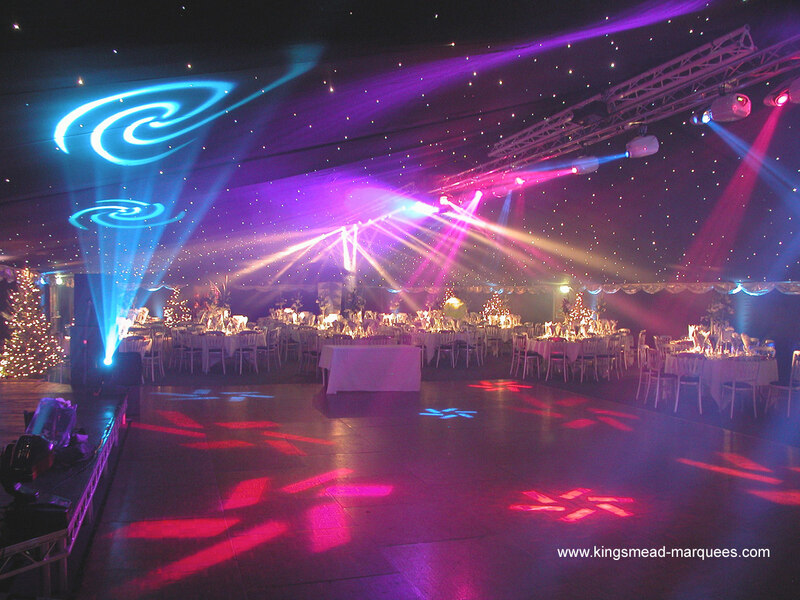 A separate dance area was created by linking directly to the client's own building and using starlight linings and special effect lighting to create the 'wow' factor. 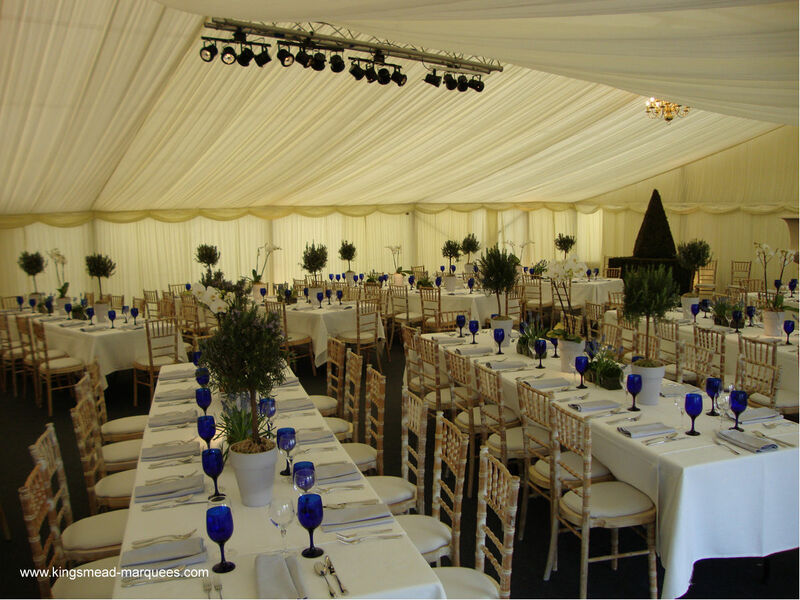 The end result, in the client's own words, was 'All our dreams came to fruition and caused our guests to gasp in wonderment at the overall effect". 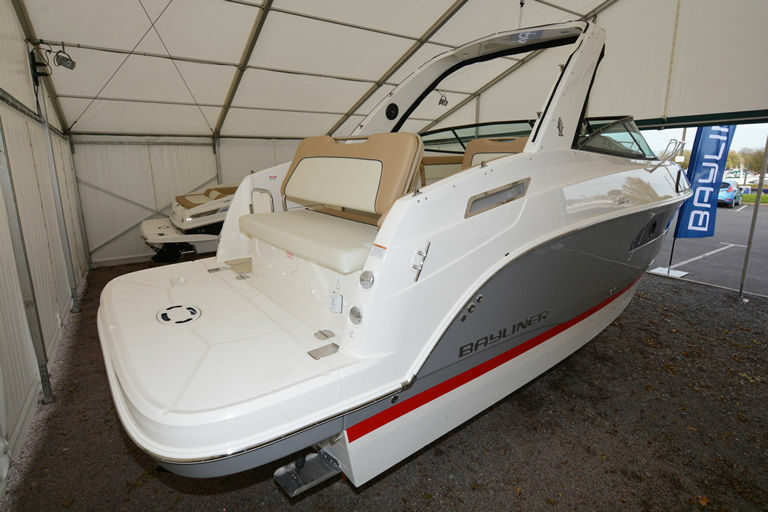 "All that you provided contributed to what was a very special occasion with your attention to detail, both in planning and execution, achieved with the minimum of fuss". Forty-six Eurospan Structures were installed on nine sites in just six days. 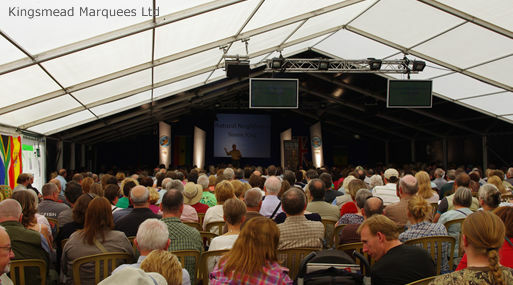 We were thrilled to be asked to provide all the marquees for The SOL 2009 Games hosted this year in Leicestershire. 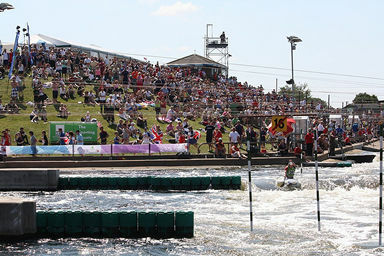 The games brought together hundreds of amazing athletes from all over the country. 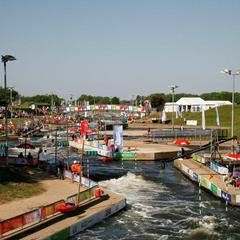 The structures were put to good use including cyber cafes, rest areas, medical services, entertainment, changing rooms, family areas, offices, media centres, and provided hospitality for the Equestrian, Swimming, Athletics, Sailing & Kayaking, Golf, Cycling, Football, and Cricket events. There were congratulations on the quality of the organisation and look and feel of the event. 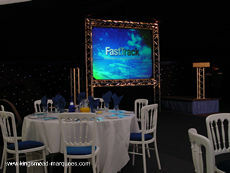 The venue looked magnificent, decked out in banners and flags with a superb sound system and ideally placed big screen. 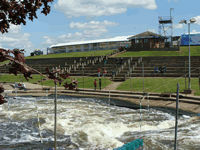 The weather was glorious, making stunning pictures for the live BBC television. 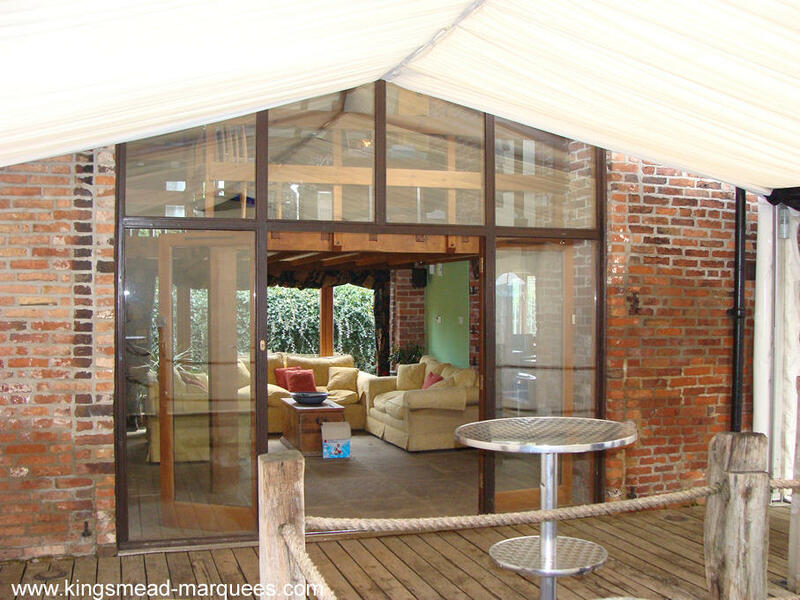 This interesting project was installed in a lovely garden over the existing decked terrace and garden water features, the combination of these provided a superb party venue. 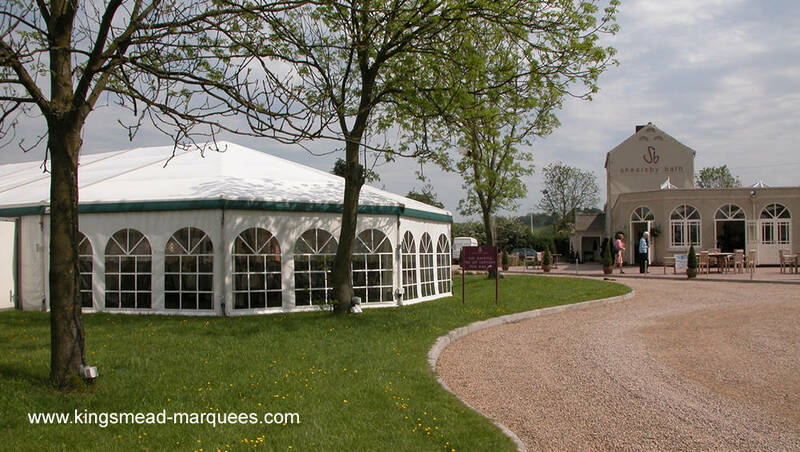 A number of different sized Eurospan Marquees were linked to each other to make best use of the available space, with one end of the marquee connecting to the house. 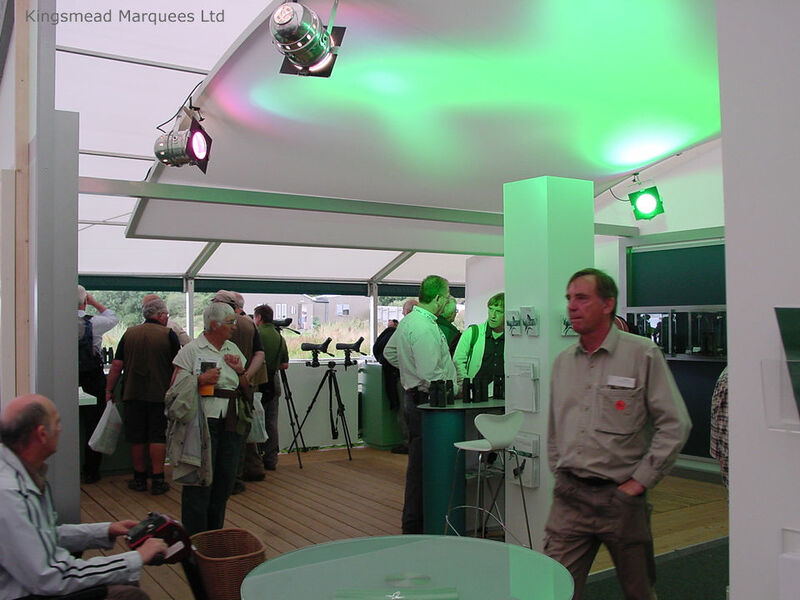 Martyn Davies, who designed the layout and managed the installation commented ~ "what on first inspection looked like an impractical space to use with various levels, obstructions, and ponds, actually turned into a very useable venue thanks to the modular design of the Eurospan system." 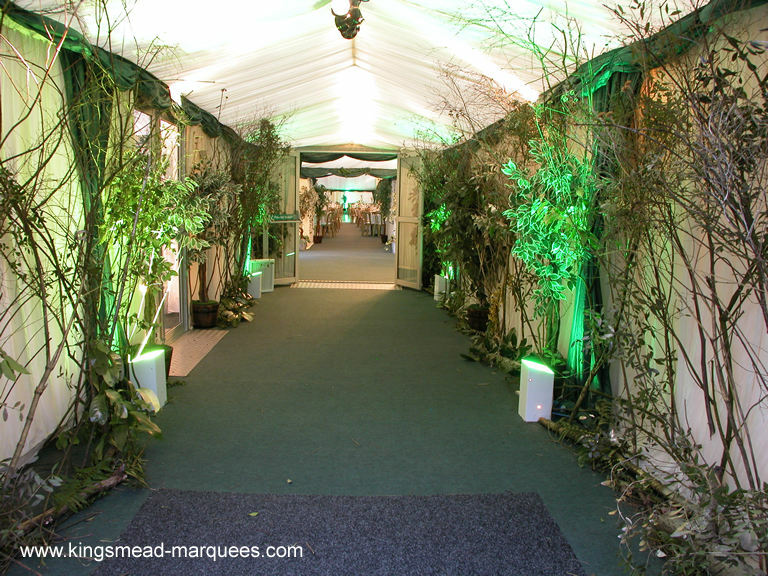 The heated marquees became an extension to the house itself and with the New Zealand themed garden illuminated with special LED lighting plus the weather providing plenty of snow, the event was a tremendous success. 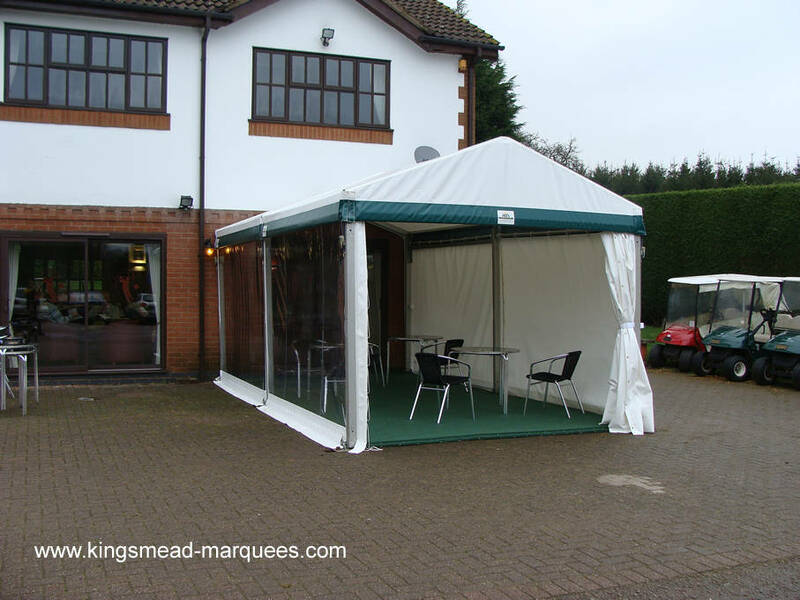 An urgent request for a replacement Smoking Shelter was received from our local golf club after their 'DIY Superstore special' blew away. 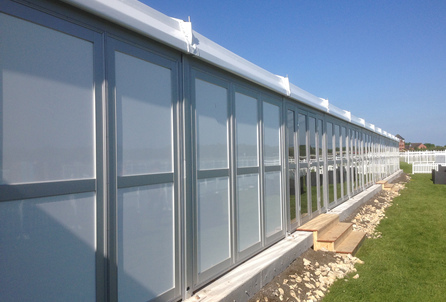 A 3m x 6m Eurospan Structure with panoramic window walls was specified and this was manufactured and installed in 10 days, a special requirement was a weather proof connection to the building without any fixings being made to the building itself. 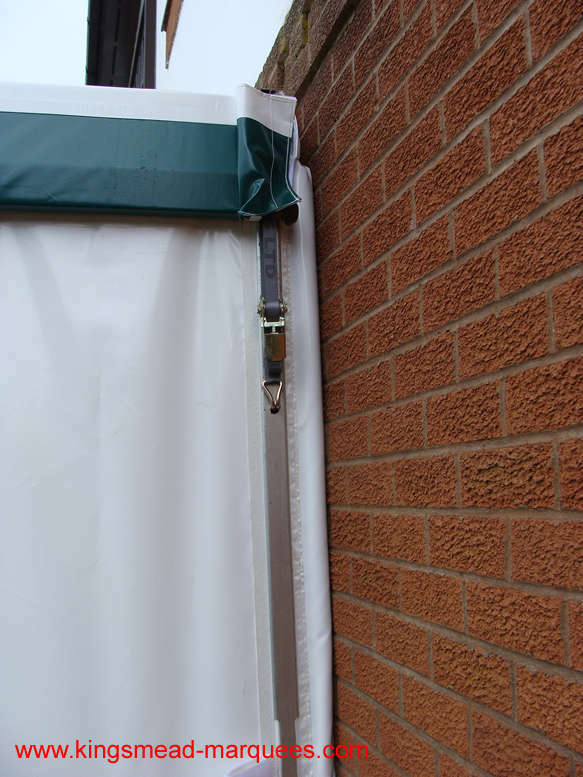 This was achieved by using a PVC cushion as shown below. 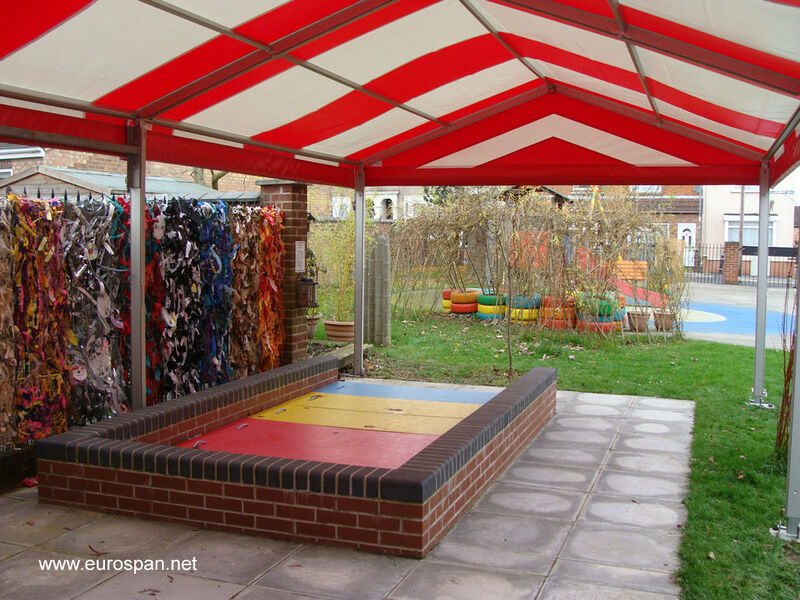 We were pleased to be asked recently to manufacture a cover for a children's play area at a local school, the cover had to be red & white and fit over the existing sand pit. 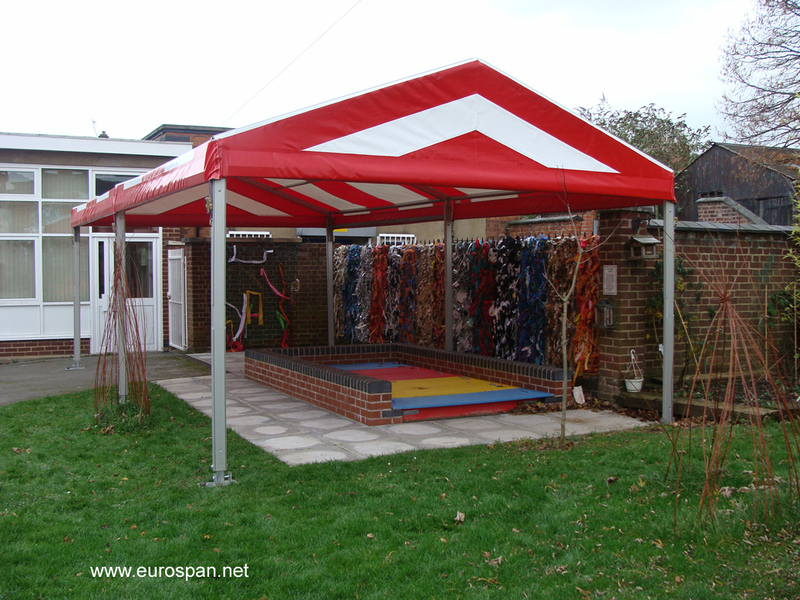 A dimensionally adjusted Eurospan Structure proved ideal and with a little imagination our fabric workshop came up with a red & white roof design. 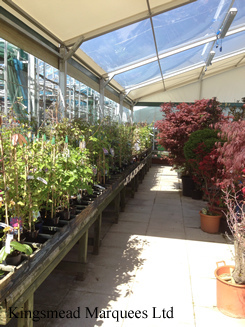 All that's required now is some sunshine ! 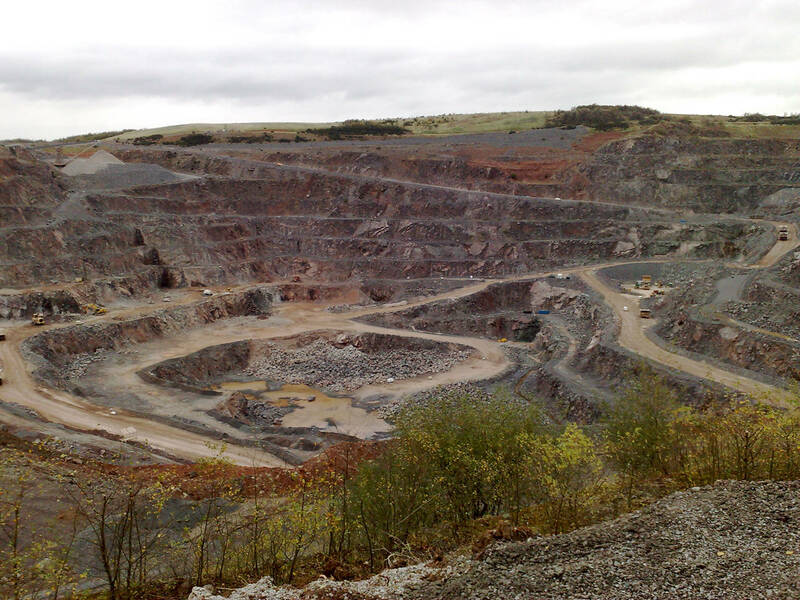 The brief was to install a Marquee on a specially prepared site on the very edge of a huge operating quarry, meeting the stringent health and safety requirement's of the quarry and provide a stunning venue for a corporate event. 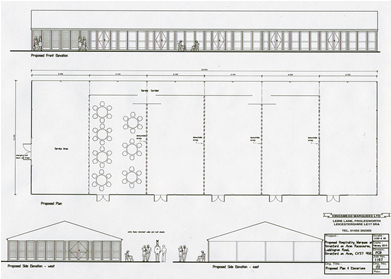 The Eurospan Structure supplied was divided internally to provide a changing room and cloakroom facilities with lockers for visitors to change into PPE equipment prior to a tour around the quarry, stopping at other marquees located at vantage points around the site. A bar area and separate dining room all fully lined, heated, and furnished were provided. 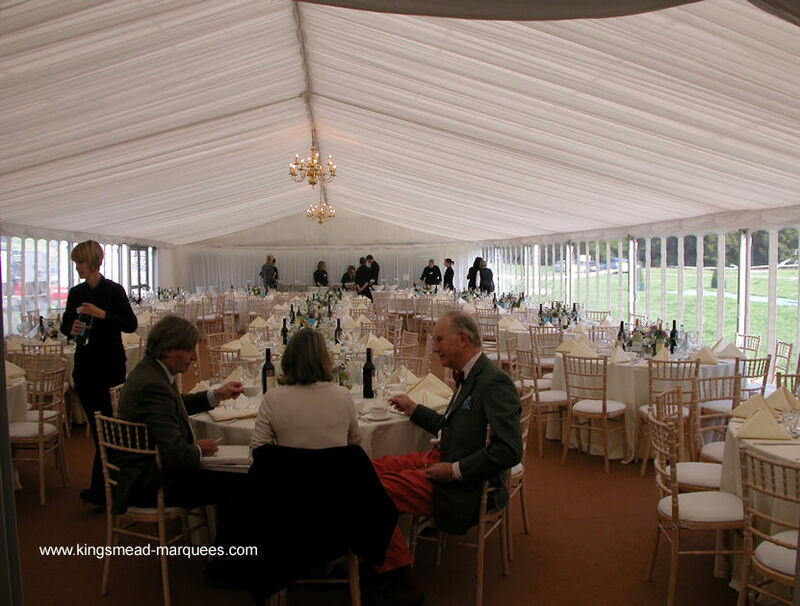 A specially manufactured 21m (70') pull cord operated 'reveal' curtain was installed to surprise the guests with the amazing view into the deep quarry through the clear window walls running floor to ceiling along the entire length of the dining room. 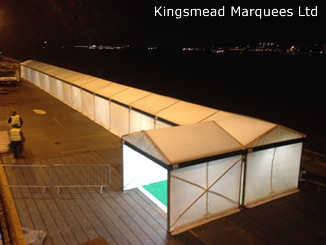 In addition, an open fronted awning 27M (90') long, fitted with our safety barriers allowed a birds eye view on the very edge as the event proceeded with explosions, special lighting effects, and large video screen presentations. 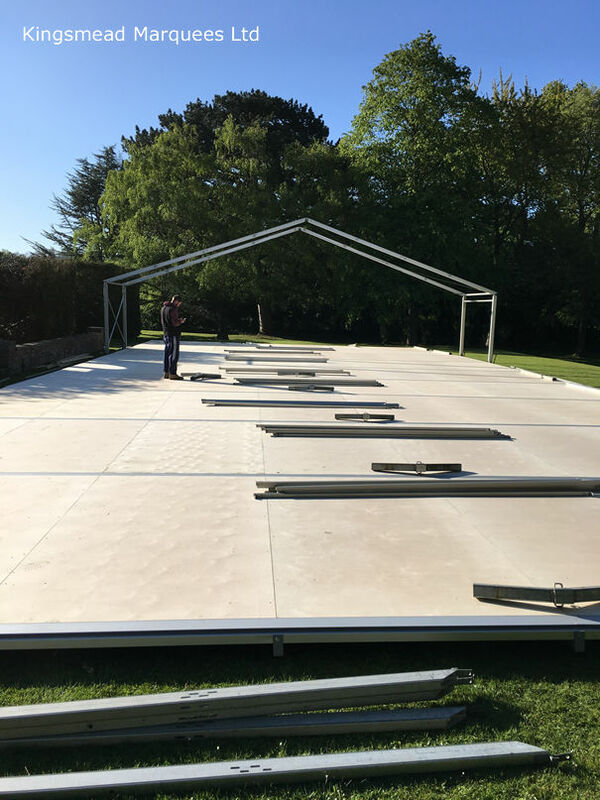 We were asked to install a Eurospan Structure for a summer wedding on a very challenging sloping site with very limited access. 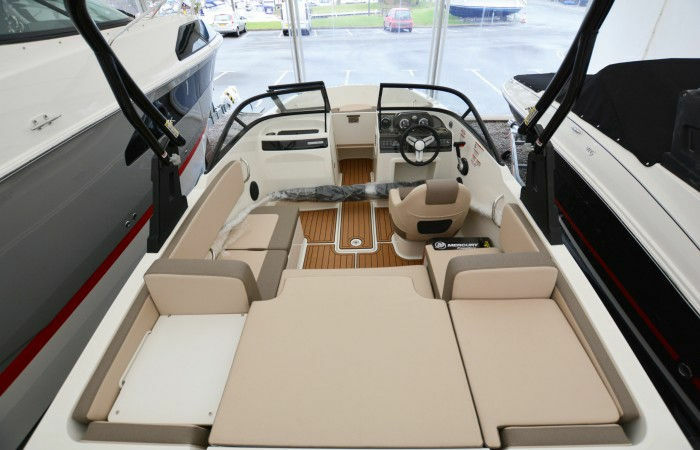 This type of site requires special flooring systems to allow a stable and safe platform to be built before the structure can be assembled. 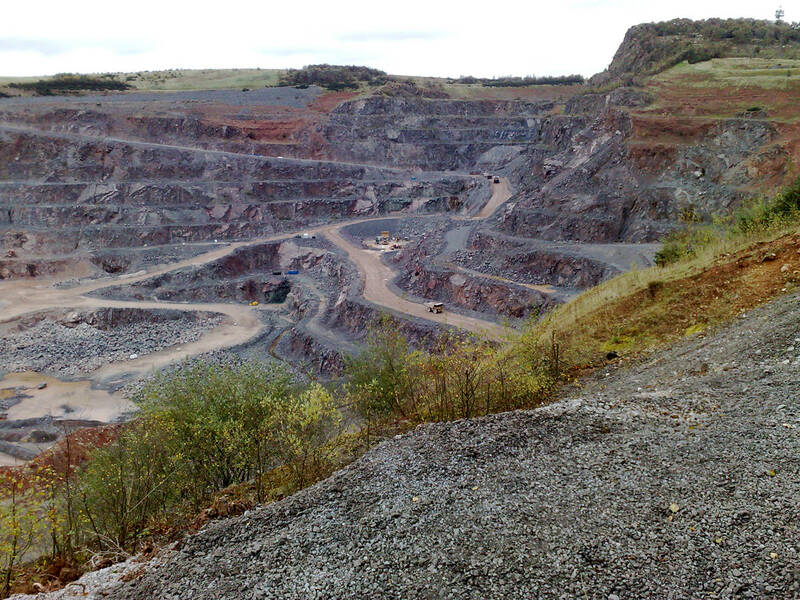 The floor was cut into the hillside at one end of the site and raised 3m (10ft) at the other, despite poor weather conditions that ruled out the use on site of all terrain forklifts, the project was completed in good time. 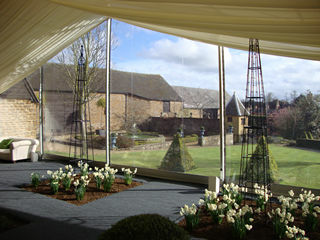 The structure was fitted with windows to take advantage of the spectacular view and our new flat lining system in ivory, black carpet, round tables, chairs with ivory covers and leather sofas plus aluminum poseur bar furniture in the reception completed the stylish look; we even managed to organise glorious sunshine for the wedding day itself! 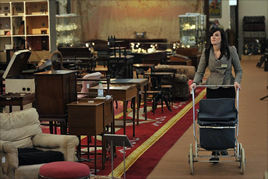 Here is another interesting location !! 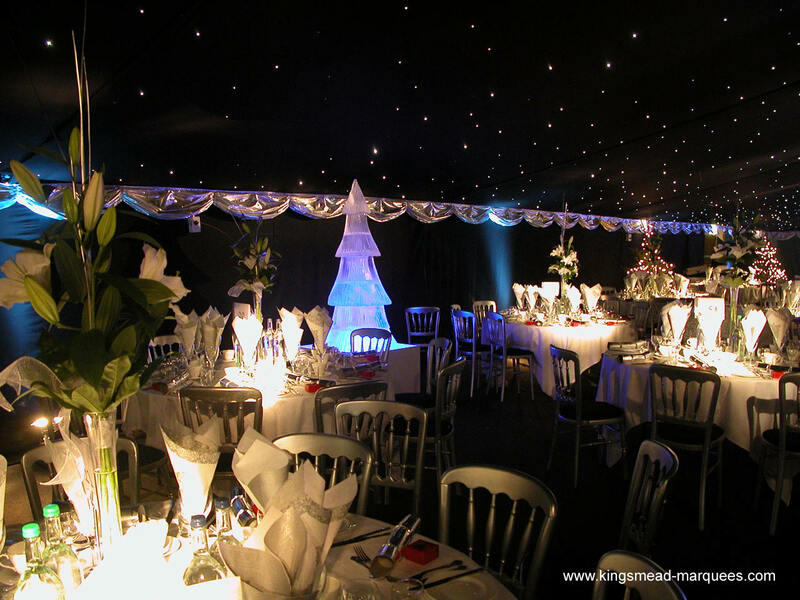 The Christmas party season kicked off at an exclusive Northamptonshire hotel. 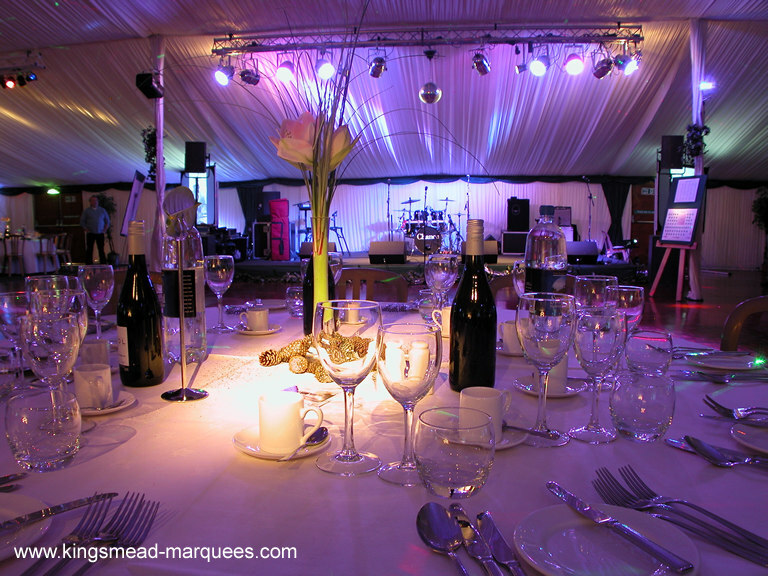 The riverside venue proved to be the perfect location for this corporate event for 400 seated guests. 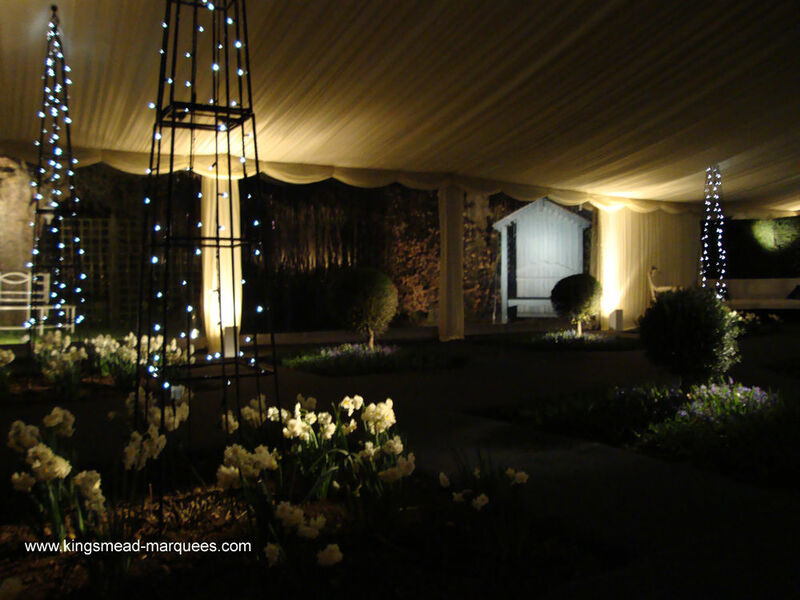 The marquee installation included an enclosed cloakroom, leading to a reception and bar area with a clear glass gable end, this enabled the guests to view a spectacular light and firework display from the warmth and comfort of the marquee. 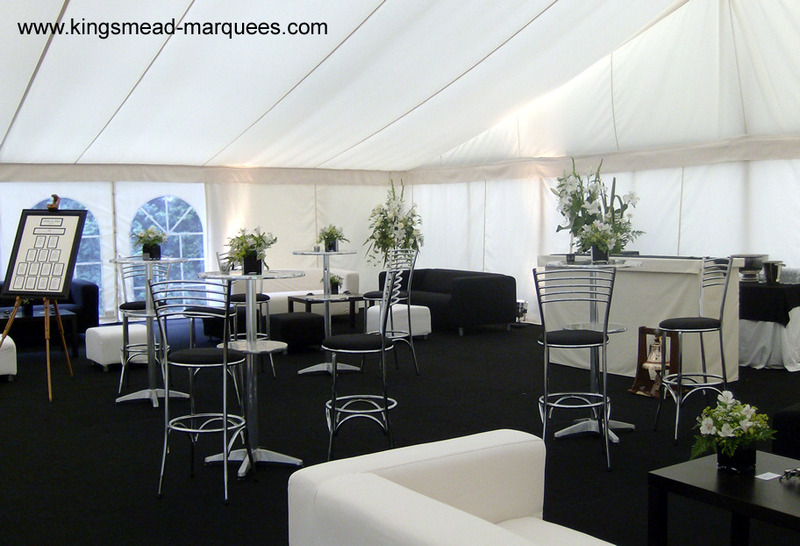 The dining and entertainment area included full fibre optic linings and extensive lighting effects. 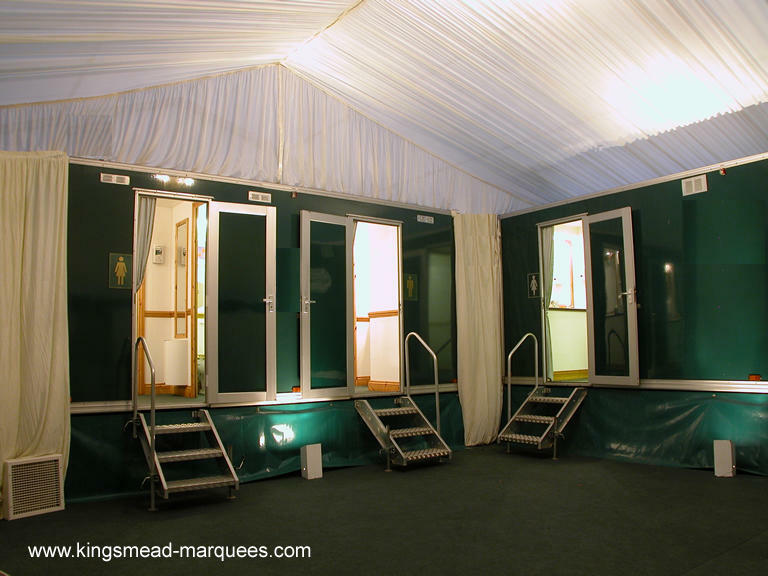 Also provided was a kitchen area and 30m link to the Hotel, all power generation and on-site services were provided by Kingsmead. 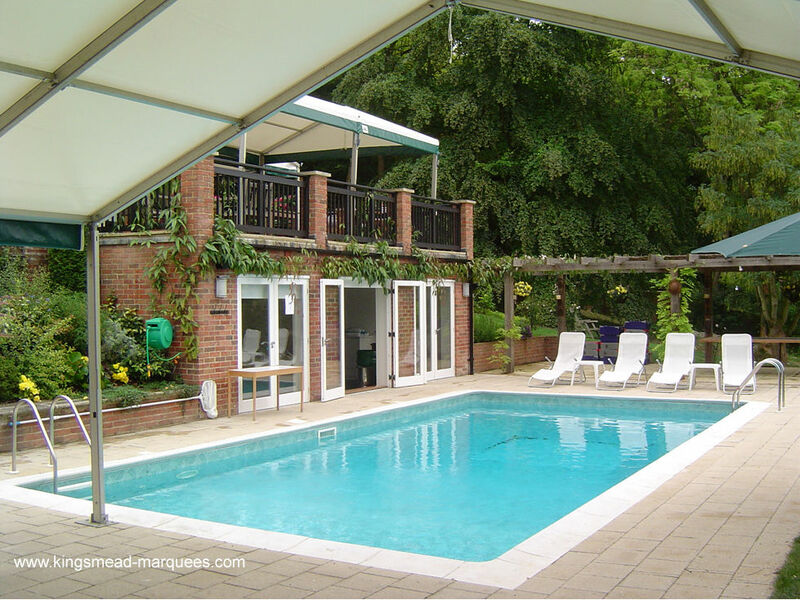 Our extensive range of Eurospan Structures has recently been updated with the introduction of two new models at 20M & 25M wide. 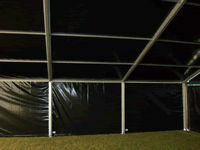 With a wall height of 3M (approx. 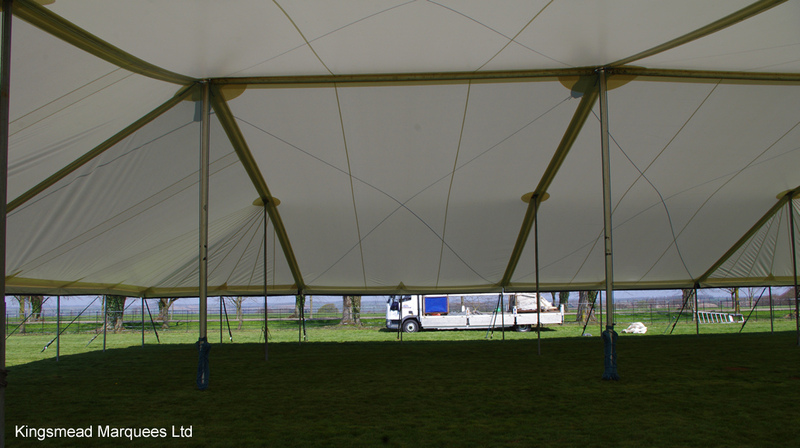 10ft) and clear span widths of either 20M (65.5 ft) or 25M (82 ft) wide,these new structures will be of interest to major event organisers. 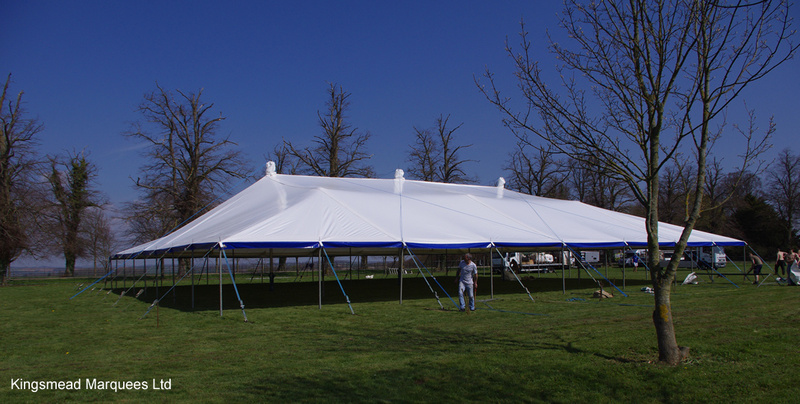 The overall length of the structures can be increased in 5M sections as required. Also available are solid wall panels, windows, door sets, and linings. 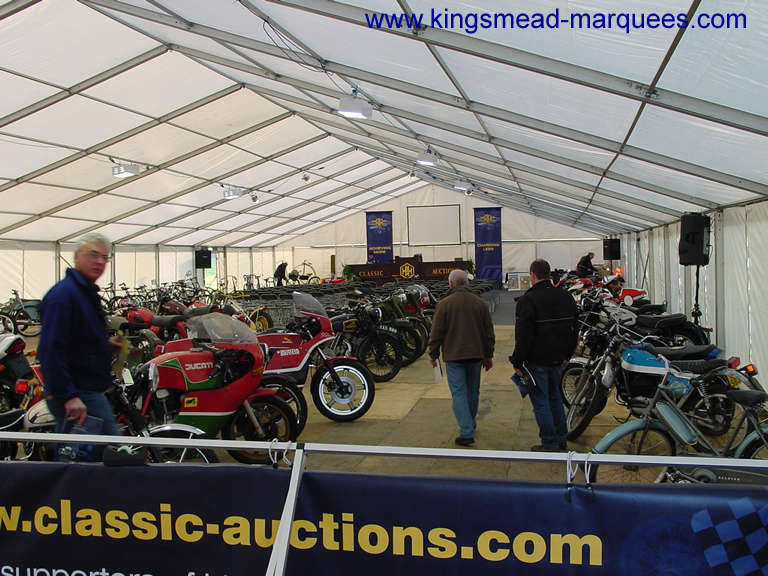 An interesting sale of classic motor cycles and bicycles was held recently at the National Motorcycle Museum near Birmingham. 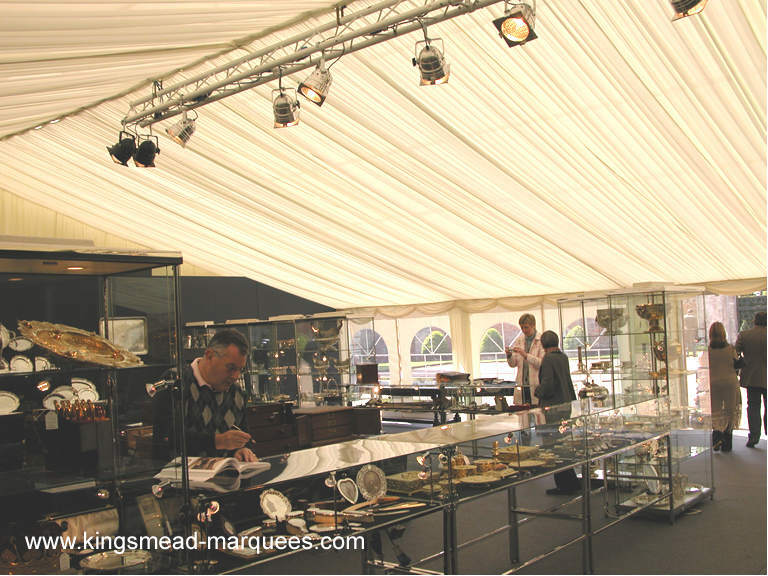 A 50' wide (15m) Eurospan structure provided the viewing and sale space. 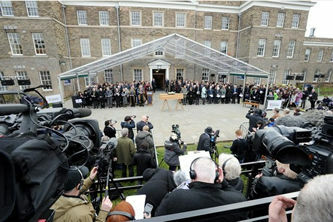 A last minute change of site within the grounds of the museum required the installation of an interlocking boarded floor system, as the site was in poor condition with mud and standing water over most of the area. 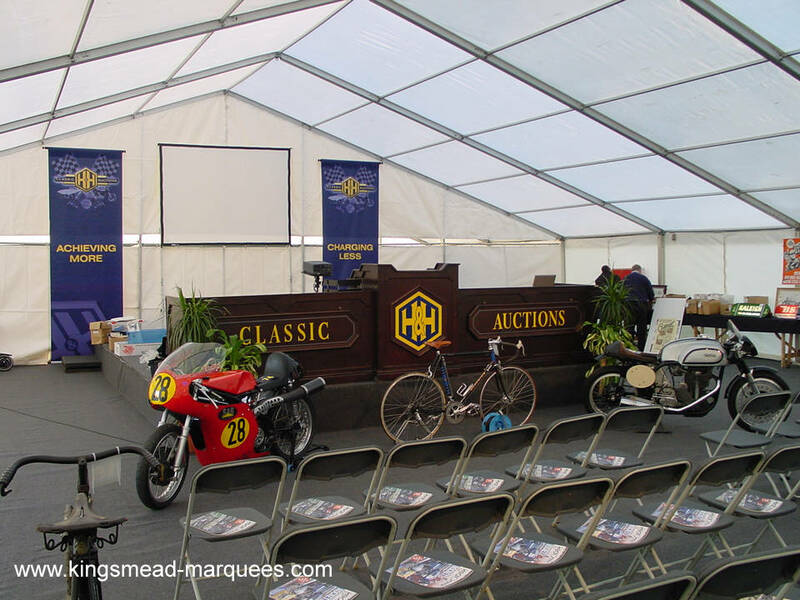 The result was a superb facility, comfortably heated and well light and from comments received from the event organizers H & H Classic Auctions exceeded everyone expectations. The beautiful grounds of Shrubland Park near Ipswich Suffolk were the setting for a three day country house sale in September. 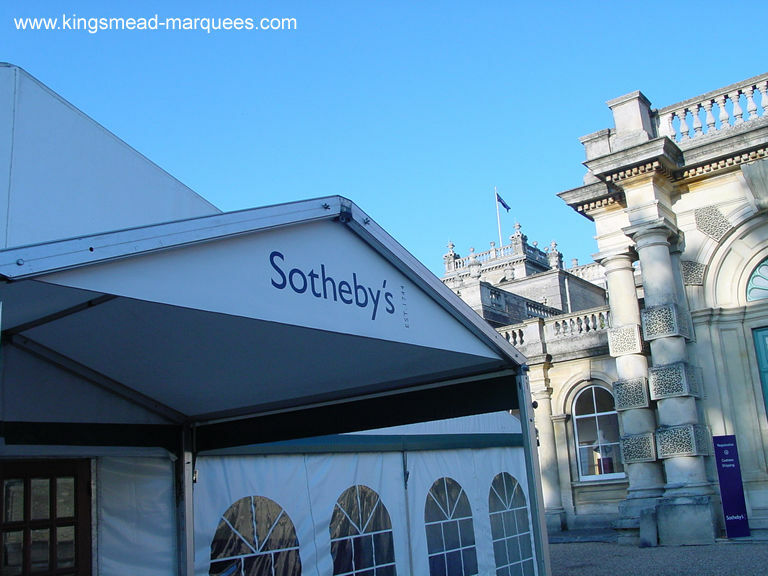 Kingsmead Marquees were delighted to again be appointed by Sotheby's this time on behalf of the de Saumarez family. 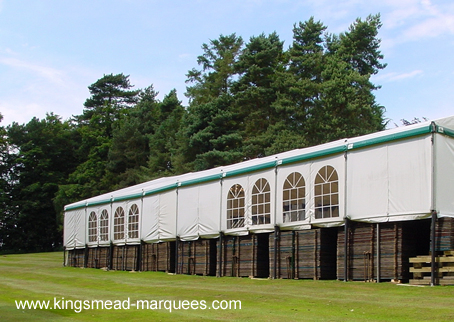 Eurospan structures were used to provide space for registration, catering, viewing, and the main sale marquee. 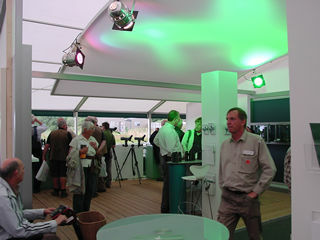 Lighting, heating, power generation, mobile toilets, furnishings, and sound equipment were all provided. 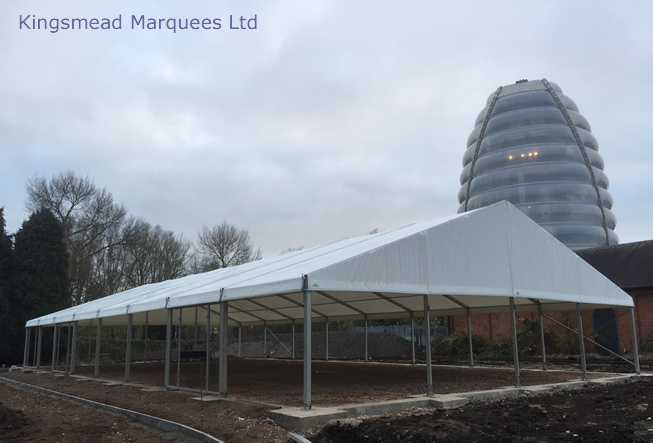 A Special 'SKYLIGHT' Eurospan structure featuring a clear roof provided the venue for the opening of a new office building for the Leicester Mercury. During the opening ceremony guests where treated to an impressive light show on the new building while seated at their tables. 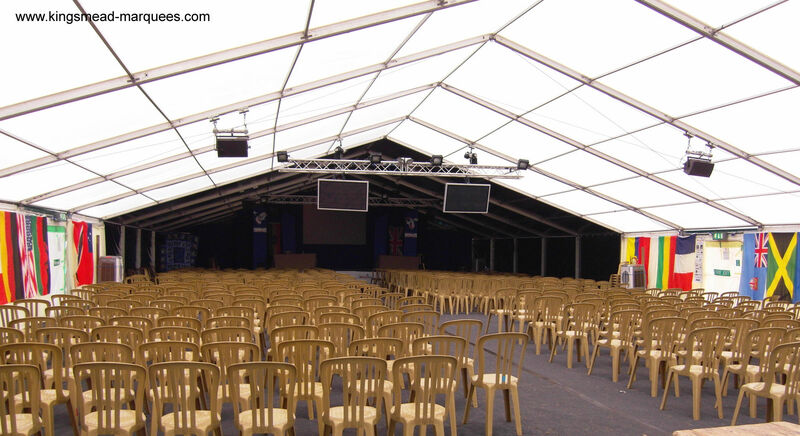 The structure was used for various functions during the week long celebrations. 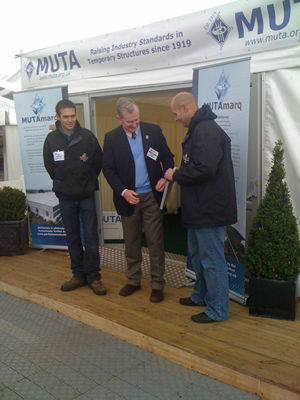 For one event a heavy duty wooden floor system was installed to allow 20 cars to be parked inside. 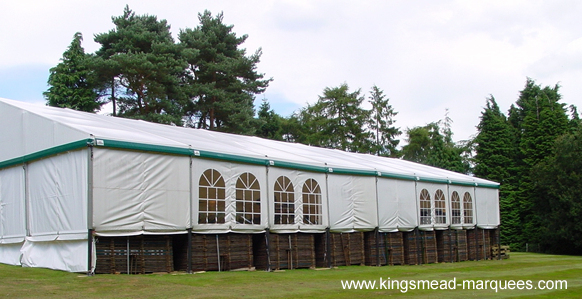 Kingsmead Marquees (southern) Ltd opened a new operating base recently at Cranfield, Bedfordshire. 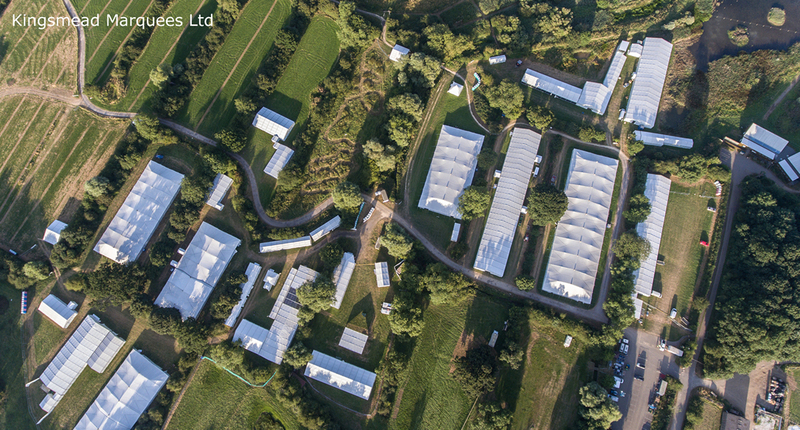 The new location will enable us to better serve our existing customers, and hopefully some new ones in Northamptonshire, Bedfordshire, Buckinghamshire, Oxfordshire and the Thames Valley. 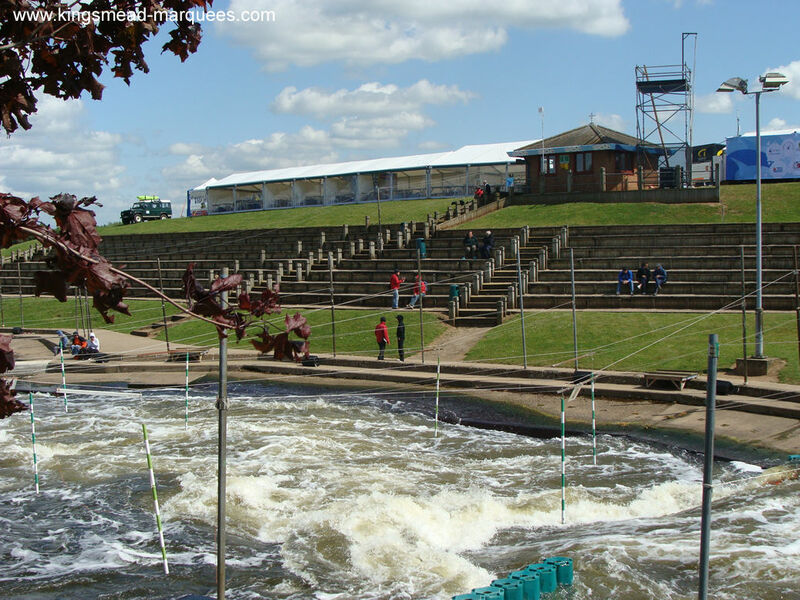 The event which has been going for over 100 years was held at Henley on Thames and Kingsmead was again chosen as the main contractor. 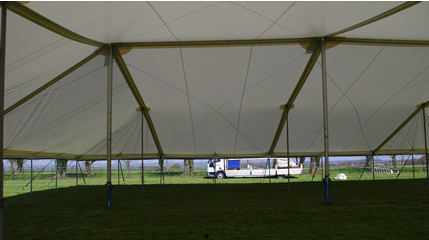 A mixture of traditional marquees and Eurospan structures made up the showground layout. 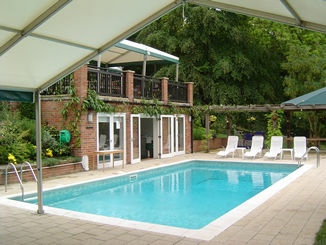 The site is set in delightful countryside and well worth a visit. 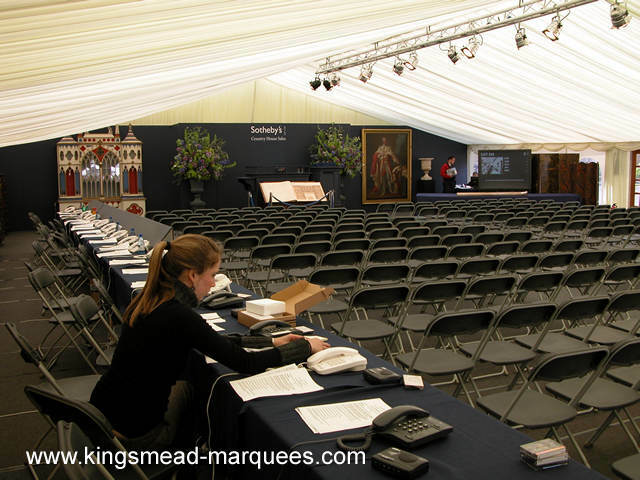 Kingsmead Marquees were delighted to be appointed by Sotheby's on behalf of Lord Hesketh to provide all the marquees and ancillary equipment for the recent high profile three day sale at Easton Neston. 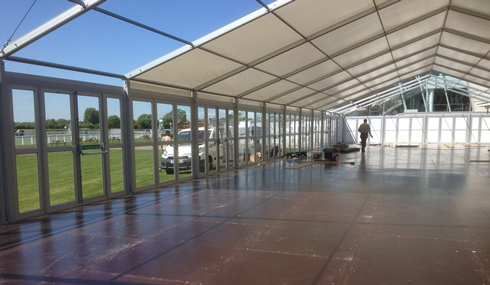 Eurospan structures were used throughout the installation and included registration, catering, viewing, furniture viewing, and the main sale marquee itself. 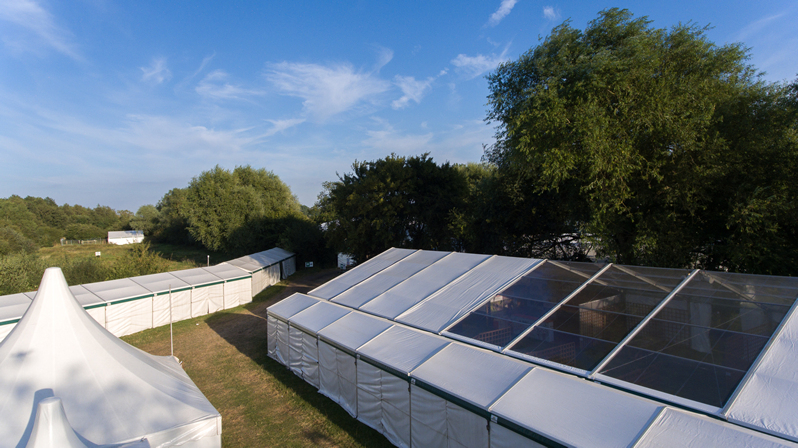 Lighting, heating, power generation, mobile toilets, furnishings, and sound equipment were all provided and maintained during the two week project. 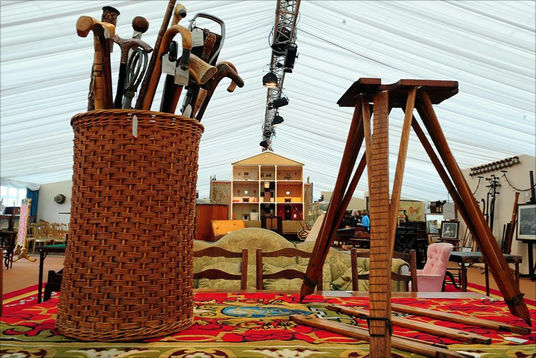 The auction included some amazing items with sales of 8.7 million pounds. 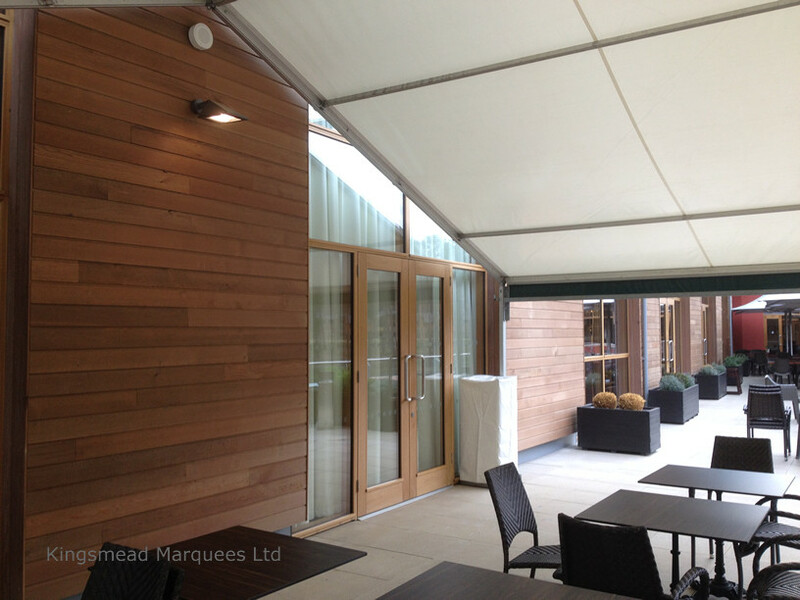 An extension to the main conference suit at The Whittlebury Hall Hotel was recently completed. The 10M wide Eurospan Structure features a heavy duty floor system to enable vehicles from the nearby Silverstone Circuit to be displayed. The hotels large sliding doors now open into the structure giving a wide clear unobstructed access to a versatile new area. 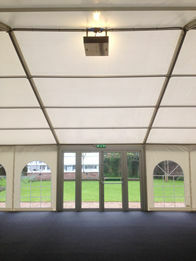 Lighting,heating,fire exit doors,carpets and pleated linings complete the installation. 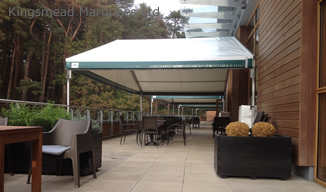 A request to enclose a balcony area to allow all year round use was the challenge recently set by Collingtree Park Golf Club, Northamptonshire. 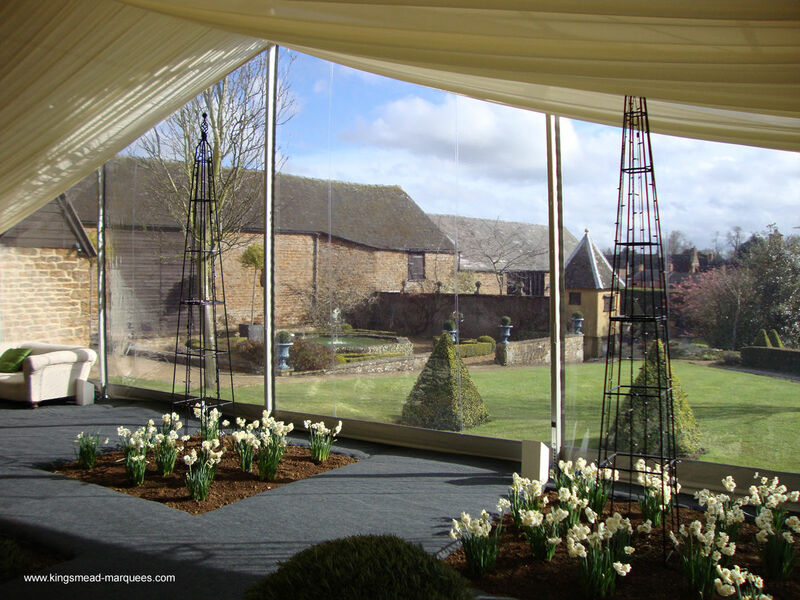 The solution was a set of curtains incorporating large flexi glass sections,these curtains are suspended from a new type of track and can be easily opened or completely removed if required. The structure was erected in the specially landscaped grounds of the hotel on a concrete base,and will provide seating for 250 dining guests, the layout includes a fully equipped kitchen with walk in freezers, extraction system and all services, while the main marquee includes a fabulous fitted bar, dance floor, linings, heating, cloakroom & toilets, theme lighting inside & out, alarm system, fire exits & emergency lighting. 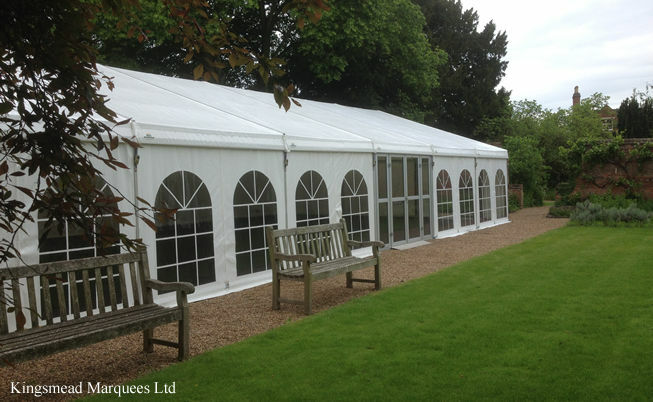 The structure also includes a special 5 sided end section fitted with arched window walls and a entrance canopy leading to glazed entrance doors. 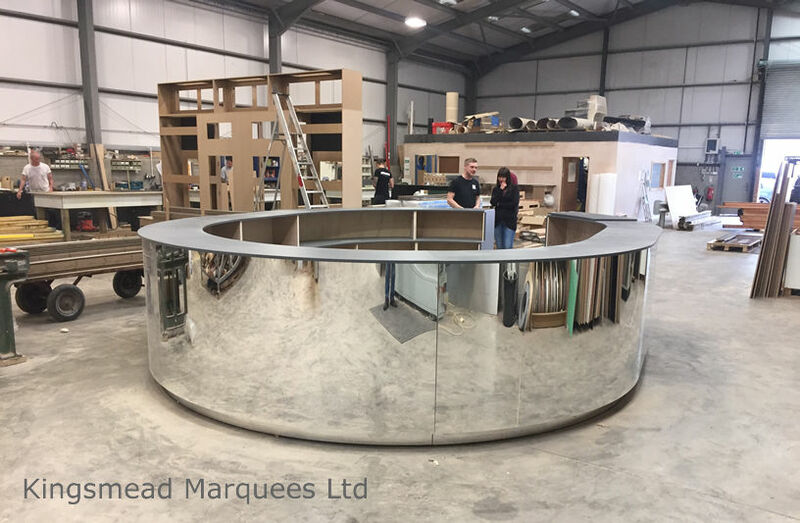 The equipment was manufactured & installed in record time as the hotel had a wedding booking just 3 weeks after the order was placed. Work started in our fabric workshop in early December on a new range of interior lining based on a kite shape,the fabric used is very elastic and can be stretched to fixing points in the roof of our range of Eurospan frame marquees,a number of over lapping 'kites' produce a stunning and refreshingly new look to the interior of the marquee. 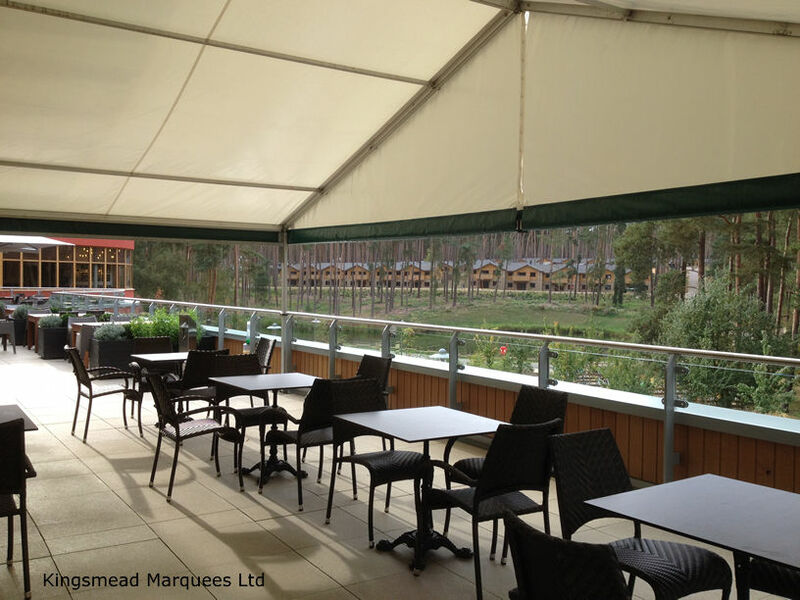 A request for a retractable canopy to enclose a court yard at the rear of a village pub became the catalyst for a completely new product. 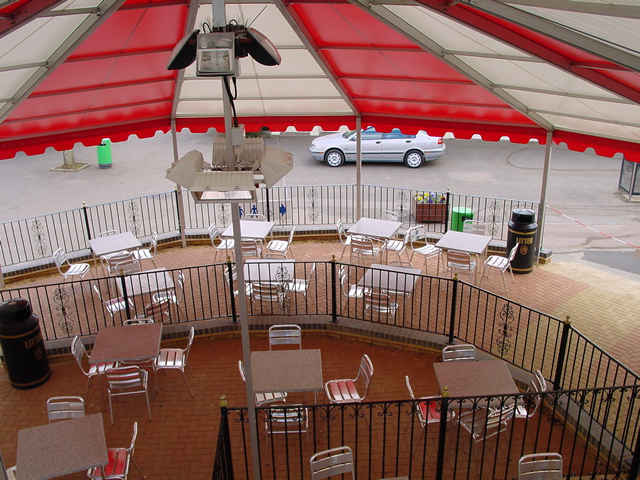 The canopy can be retracted quickly on to an aluminum roller, and deployed just as easily by pulling a cord. 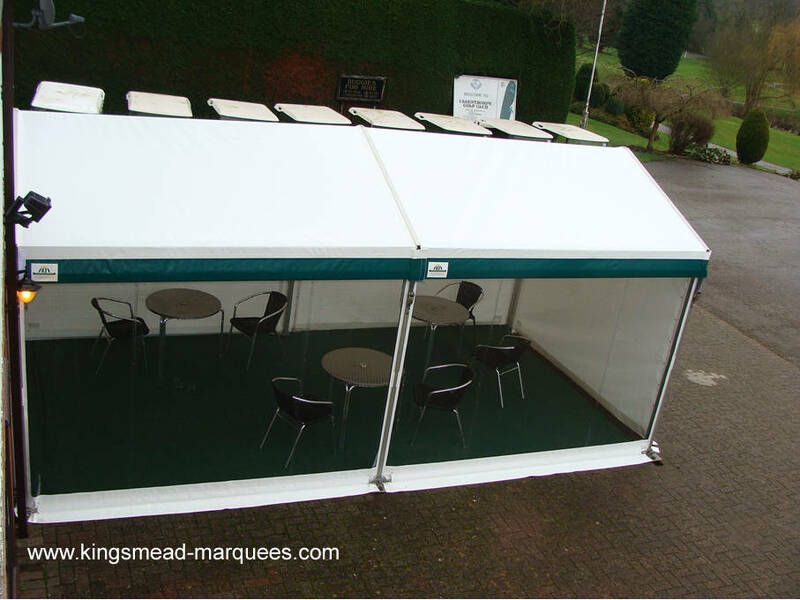 The canopy can be fitted with side walls to allow all year use, adding a valuable extension to the pub. 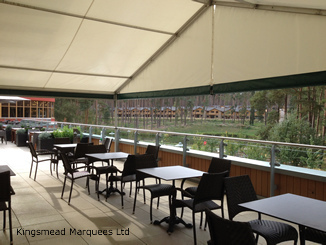 Ian & his team from our southern depot spent a week refreshing the Eurospan hospitality structures we installed 5 years ago at Towcester Racecourse, the project included washing the PVC outer membrane of the marquees, and removing the interior linings which were washed in our laundry department at Frolesworth, after re fitting the whole installation looks as good as new, and proves just how little maintenance these structures require. 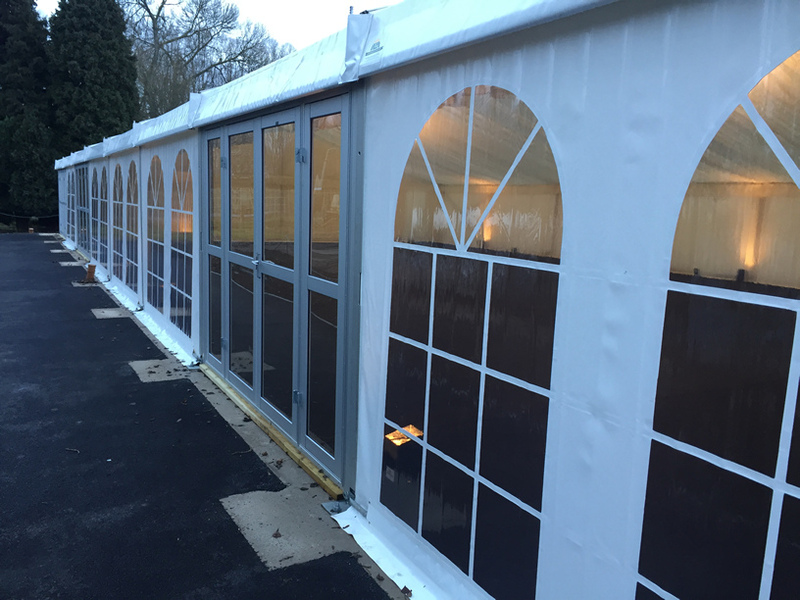 While on site another permanent structure was installed to replace the ticket office,this was fitted with a new type of glass door with glass side panels, the finished result looked so smart that we decided to make these doors available in our standard hire range. 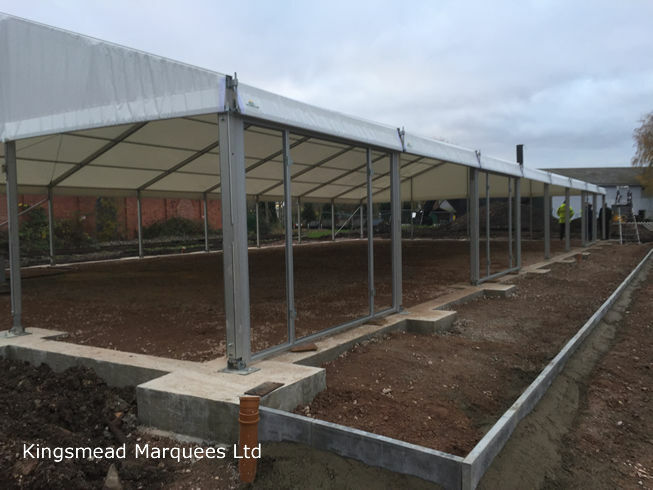 A very stylish and unique permanent Eurospan frame structure was installed in April at Wicksteed park near Kettering. The design team headed by Andrew Breward was delighted to win the contract for this project despite stiff competition and cheaper alternatives. The bespoke design however makes best use of the various levels across the site, and integrates perfectly with the existing buildings, one of which is a partly enclosed fabulous old timber Coffee shop. 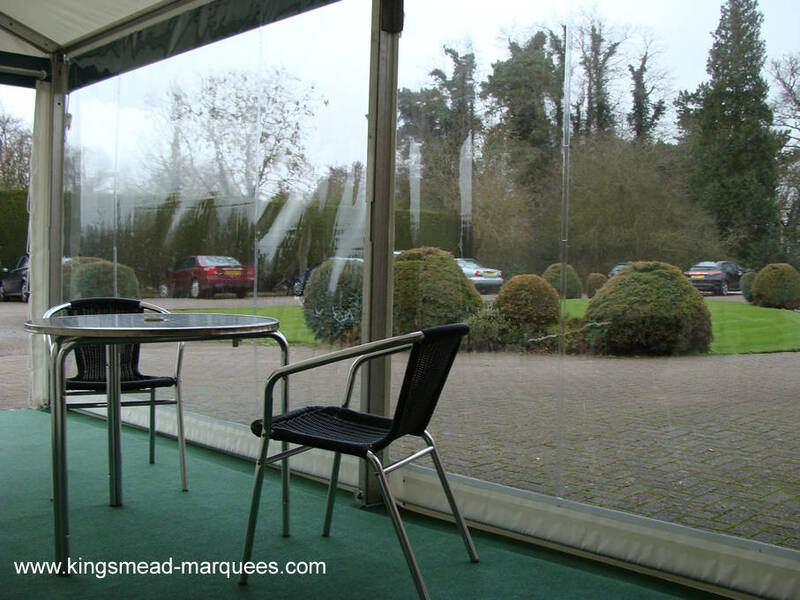 Now we can reveal our secret weapon, unique to Kingsmead ~ our fully furnished showroom where you can sit at your leisure and visualise the marquee interior of your dreams. 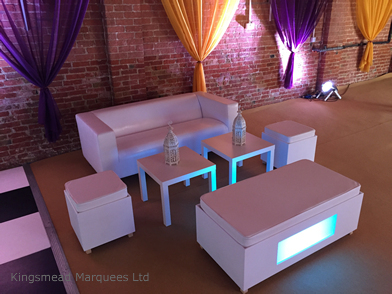 Choose from our sumptuous array of lining trims and our colour co-ordinated collection of furniture, and view our range of dance floors that you will be dancing the night away on! You will also see our specialised range of lighting specifically designed to create that all important atmosphere; the range includes stunning chandeliers, uplighters, pinspots and fibre optic starcloth. 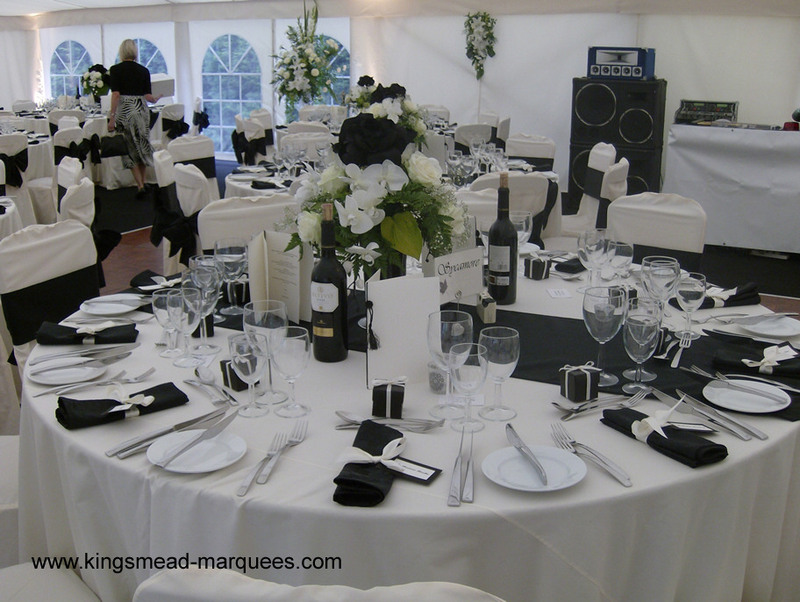 Relax and peruse our extensive photograph albums to help you decide on your scheme; whether it is to be from classic creams to stunning black & white we can help you to achieve that individual look. 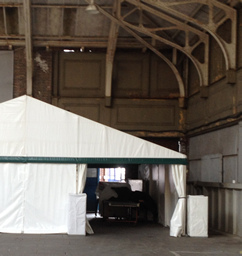 While you are with us why not take a look around our workshops and see the marquees being made! 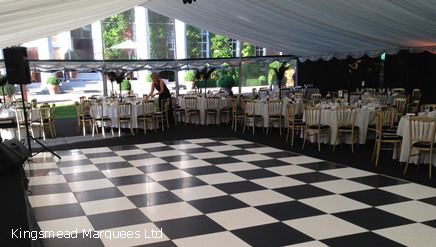 A new phenolic faced dance floor has been introduced to offer as an alternative to our range of parquet & black & white dance floors. 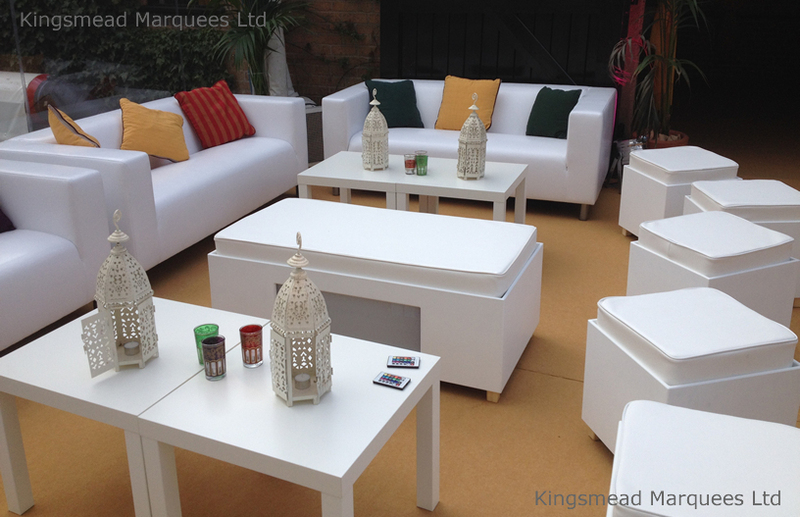 The new range has a ramp edge all the way round and is ideal for laying on coco matting or carpet, the hire cost will be half as much as other floors in our range and should prove popular for events requiring large dance floors. 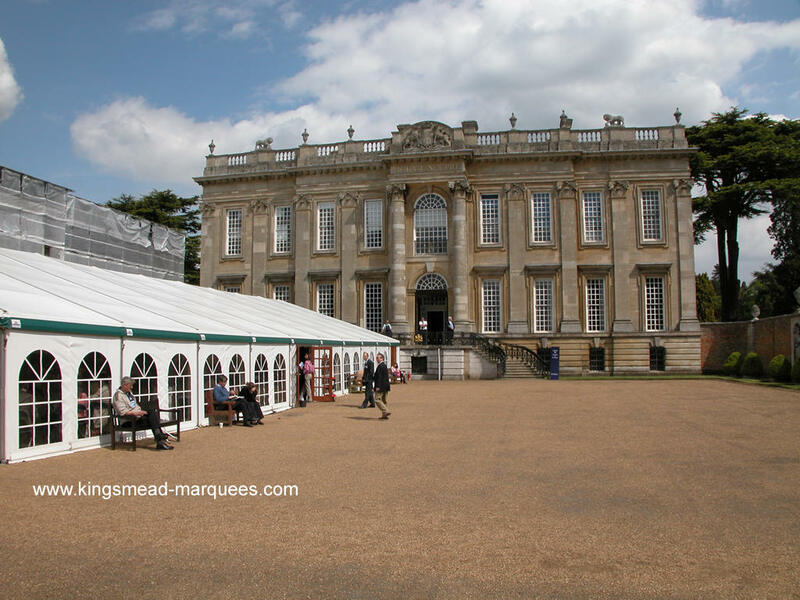 Kingsmead for the 12th year provided all the marquees at this years British Bird Watching Fair held at Egleton Nature Reserve near Oakham, Rutland. 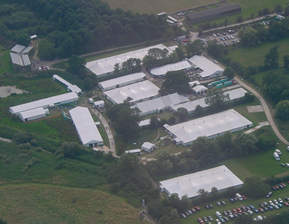 The fair is now the largest of its type in Europe attracting visitors from all over the world, our semi-tensile 25m wide marquees provide accommodation for the main trade stands with Eurospan Structures used for lecture theatre,cinemas,and catering,specially modified marquees over looking Rutland Water allow visitors to try out the latest optical & photographic equipment.